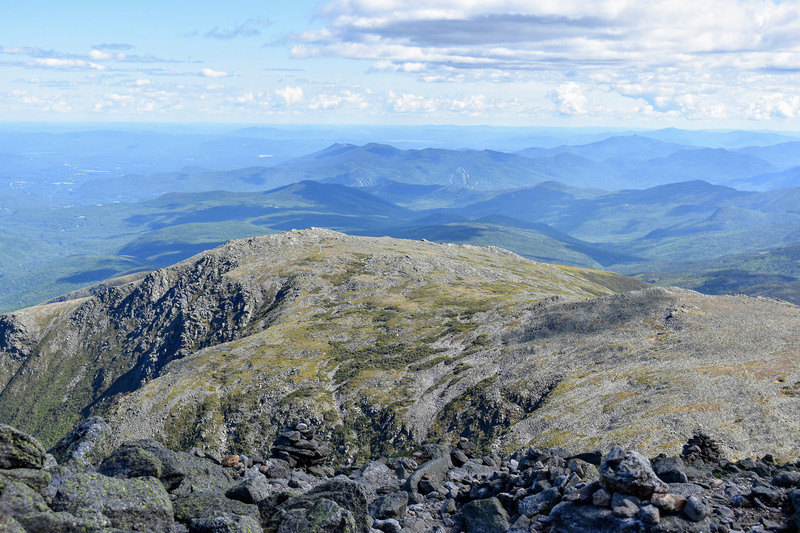 The region’s tallest peak, Mount Washington is a prize of the Northeast and one that can be climbed over and over by numerous different routes. 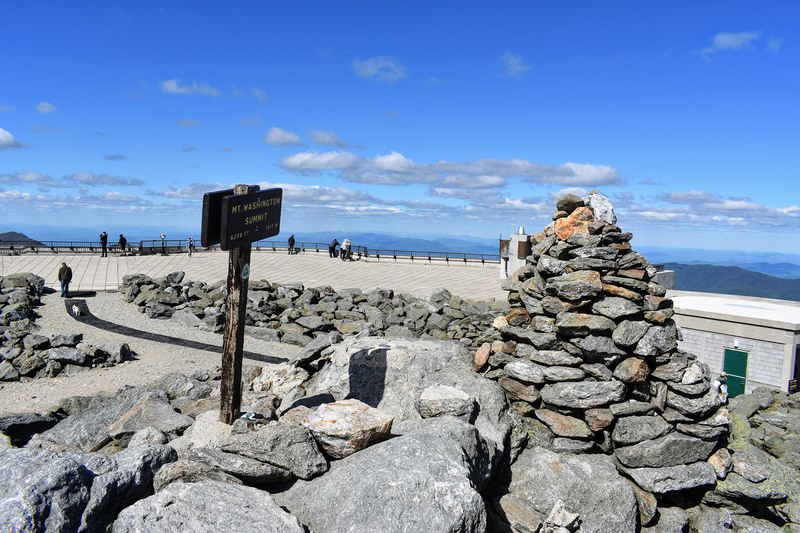 A long and notable history, the distinction of being New Hampshire’s tallest peak, and a reputation for being the “home of the world’s worst weather” are just a few reasons Mount Washington tops many peakbaggers’ lists. And, with routes varying from serene to scary, there are plenty of different paths to the peak. 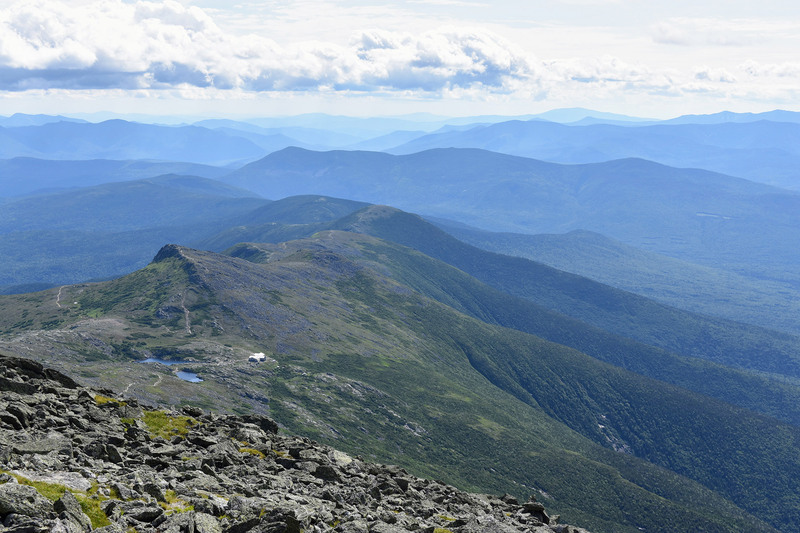 Most Mount Washington day hikes start on either the east or west side. For starting on the east side with the Tuckerman Ravine Trail, Lion Head, or Boott Spur, hikers should park at the Appalachian Mountain Club’s Pinkham Notch Visitor Center in Gorham, just north of Jackson on Route 16. It’s about a 25-minute drive from North Conway to Gorham. For a west side hike, such as the Ammonoosuc Ravine and Jewell Trails, hikers should park at the Ammonoosuc Ravine Trailhead. From Route 302, turn onto Base Road at the intersection of Bretton Woods and Fabyan’s Restaurant. The parking lot is on the right, several miles down the road. Confused? Just follow the signs for the Mount Washington Cog Railway. Pro Tip: Get an early start. On most weekends, the lots at Pinkham Notch and the Ammonoosuc Trailhead fill up quickly. For Pinkham, there’s overflow parking just south of the Visitor Center and additional parking on the street. Distance: 8.2 miles, round trip. Of all the routes to the summit, an ascent via the 4.1-mile, one-way Tuckerman Ravine Trail is perhaps the most sought after, as it climbs directly up the notorious glacial cirque and backcountry ski destination. Because snow and ice may cover the terrain from late fall to early summer—making it more of a mountaineering route than a hike—and due to its popularity, this trail may be busy when in prime condition. Starting just behind the Pinkham Notch Visitor Center, the Tuckerman Ravine Trail begins rather benignly. The wide-yet-rocky trail gradually works its way up the roughly 2.5 miles to Hermit Lake and the base of Tuckerman Ravine. As a note, this section may be particularly busy, as Hermit Lake is a popular destination itself. Above Hermit Lake, the trail climbs a series of narrow, steep, and often slippery switchbacks that deliver hikers to the top of the ravine. From here, the tops of the summit buildings come into view, and it may seem like the difficulty is over. However, you still have a long way to go. 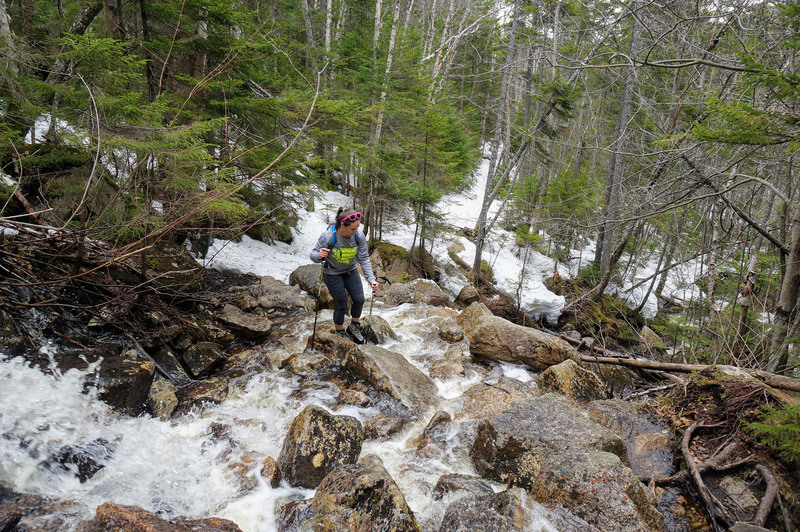 Arguably, the final mile of the Tuckerman Ravine Trail is its most challenging, as it involves as much rock-hopping as it does hiking. As you near the top, the sounds of the Auto Road get increasingly louder, and eventually, the trail runs into the road. Here, hikers tackle the ascent’s final challenge: a steep staircase that deposits you near the summit sign. Because of the trail’s steep and slippery nature, hikers should descend via the Lion Head Trail. Distance: 8.4 miles, round trip. 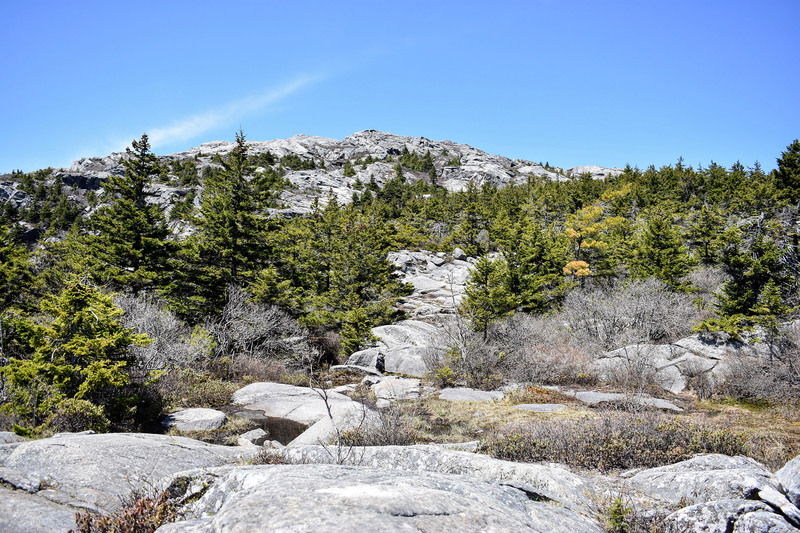 The Lion Head Trail is a popular alternative to the Tuckerman Ravine Trail. 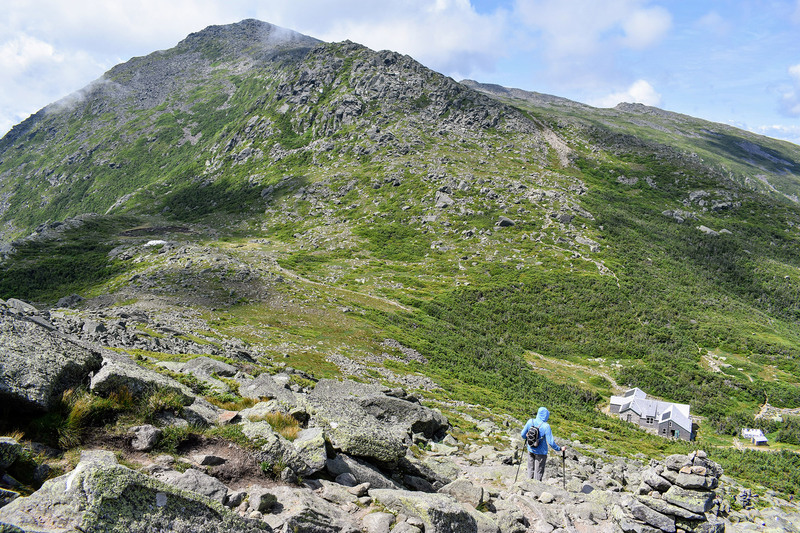 The trip offers hikers less exposure, gives you a bird’s-eye view of the ravine, and gets you to the peak when the Tuckerman Ravine Trail’s conditions aren’t ideal. The trip up actually follows the Tuckerman Ravine Trail for large portions; however, it veers off to skirt the ravine’s northern edge, rather than ascend directly up it. Commonly thought to be one of the “easier” routes to the summit, the Lion Head gains roughly 4,200 feet of elevation along its 4.2 miles, and is challenging for even seasoned hikers. Before leaving home, make sure you know which version of the Lion Head Trail—Summer or Winter—is open by checking the Mount Washington Avalanche Center’s trail information. While both leave from the Tuckerman Ravine Trail, the Winter route branches off shortly before Hermit Lake, and the Summer route starts at Hermit Lake. The latter is less steep and a bit quicker than the former. However, it also crosses an avalanche path, and is only open when there is no possibility of the snow sliding. Want to learn more about the Lion Head in winter? Check out this goEast article about it. 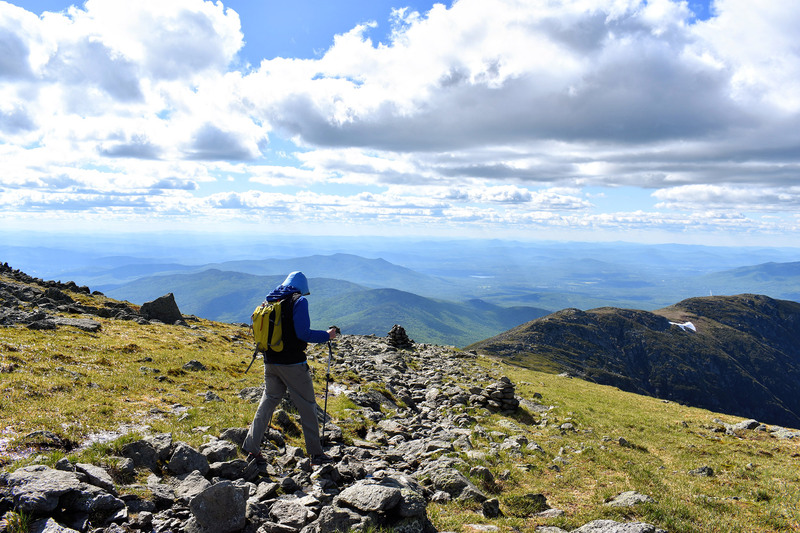 Above treeline, the Lion Head Trail affords an incredible view of Tuckerman Ravine from its granite ledges—if the weather allows, that is. If the weather doesn’t cooperate, and especially if it’s windy, be careful. A good gust could blow an unsuspecting person into the ravine. Yes, the trail is that close to the ravine’s rim! The Lion Head Trail rejoins the Tuckerman Ravine Trail at a well-marked junction for the final 0.4 miles to Washington’s summit. Distance: 10.8 miles, round trip. Looking for a little bit longer and less crowded hike up Washington’s east side? 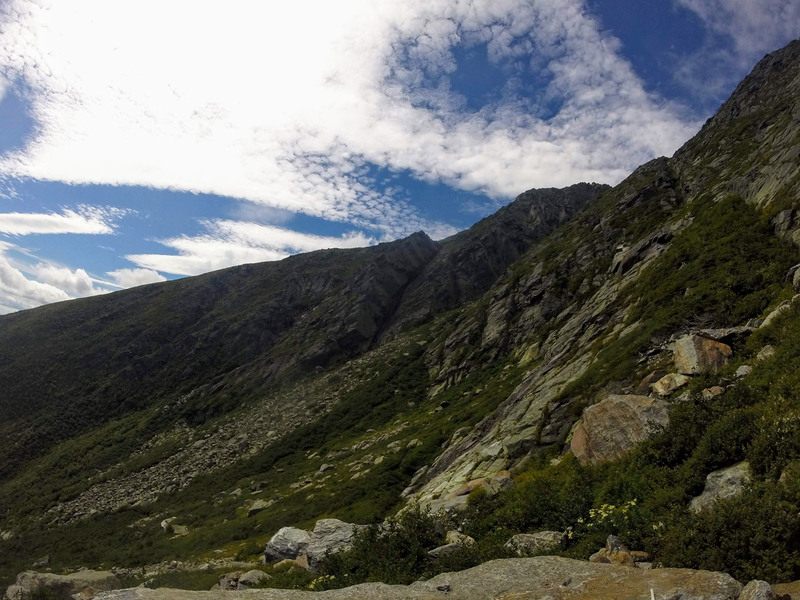 Check out the Boott Spur Trail, which climbs the ridge forming the southern side of Tuckerman Ravine. 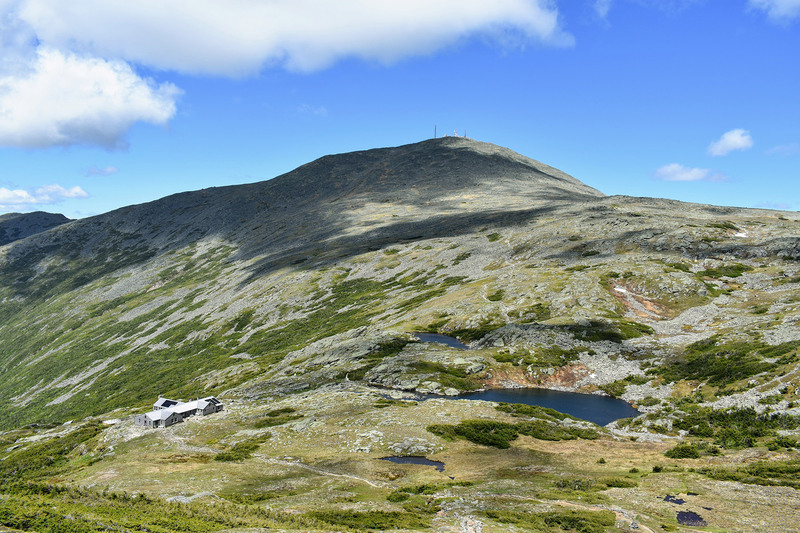 Once above treeline, hikers get spectacular views of Hermit Lake, Tuckerman Ravine, and, in the distance, Mount Washington’s summit cone as they ascend the steps of the Boott Spur, a 5,500-foot sub-peak of Mount Washington. 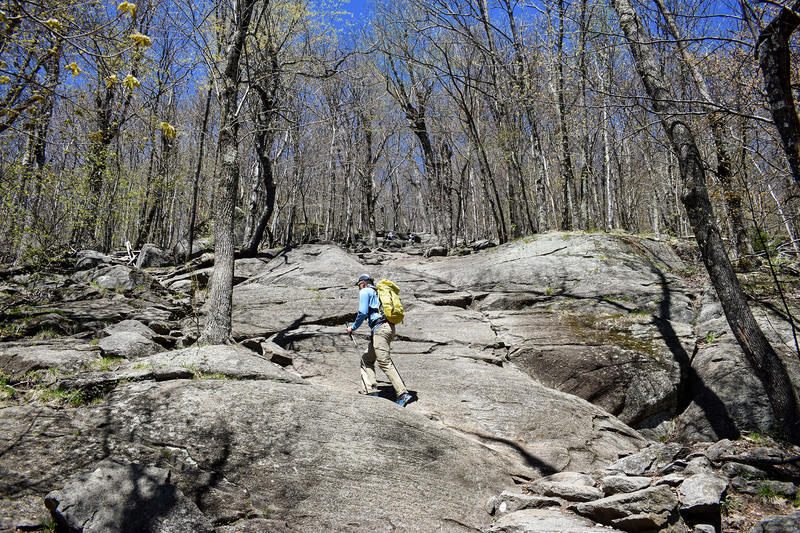 To access the Boott Spur Trail, hikers begin at Pinkham Notch and hike an easy 0.4 miles on the Tuckerman Ravine Trail. The Boott Spur Trail begins at a signed junction where the Tuckerman Ravine Trail makes a sharp right turn and begins climbing uphill. Hikers will quickly cross the John Sherburne Ski Trail and then climb forested terrain up the ridgeline. 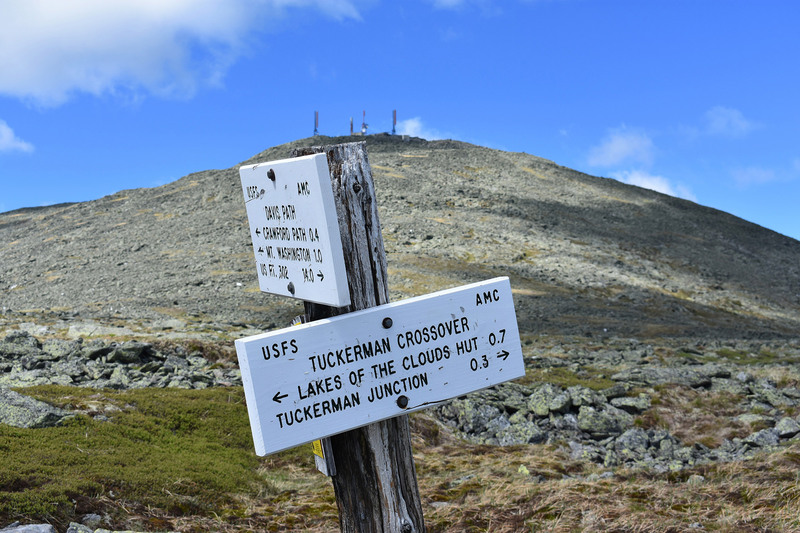 Above treeline, the trail summits Boott Spur and then traverses along the edge of Tuckerman Ravine, until it joins the Davis Path. From there, there’s approximately two miles of rock-hopping to the summit. Overall, climbing Washington via this route is 5.4 miles, with an elevation gain of 4,654 feet. And, since so much is above treeline, make sure to save it for a nice day. Distance: 4.5 miles, one way. One of the White Mountains’ hardest and most dangerous trails, the Huntington Ravine Trail should only be attempted by experienced hikers who are comfortable with exposure. To get there, follow the Tuckerman Ravine Trail 1.3 miles to the junction with the Huntington Ravine Trail and then follow the trail 2.1 miles as it climbs 2,450 feet to the Alpine Garden. The trail initially climbs through forested terrain, before it reaches a junction with the Huntington Ravine Fire Road. It then enters Huntington Ravine, gradually transitioning from a trail to rock-hopping through the bottom of a huge open boulder field called “The Fan.” Navigating up, over, and around these boulders is fun and challenging. After working through The Fan, continue on the Huntington Ravine Trail as it ascends steeply toward the top of the ravine. Some portions of the upper section require scrambling and rock climbing-like moves to ascend. These sequences have serious exposure and may be difficult to reverse if you get stuck or the weather deteriorates, so only attempt this route on nice days when the trail is dry. On a clear day, though, this section offers a fantastic perspective of the Huntington Ravine. At 2.1 miles, the Huntington Ravine Trail exits the ravine and intersects with the Alpine Garden Trail. Hikers heading for the summit should continue on this moderate section for 0.3 miles until it ends at the Mount Washington Auto Road and the junction with the Nelson Crag Trail. From there, it’s 0.8 miles of rock-hopping on the Nelson Crag Trail to the summit. Pro Tip: The Huntington Ravine Trail is hard enough to ascend. Don’t use it as your descent route. Distance: 9 miles, round trip. The Ammonoosuc Ravine Trail (“The Ammo”) is the quickest route up to the Lakes of the Clouds Hut (3.1 miles) and a beautiful way to start a hike to the summit of Mount Washington (4.5 miles). The trail follows a crystal-clear stream up the ravine, eventually climbing steeply as it passes several waterfalls. A little way before Lakes of the Clouds, the trail pokes above treeline, crossing a series of open ledges to the hut. These ledges offer hikers fantastic views of Washington’s summit cone and back west, and are a great place to catch your breath. At the hut, refill your water bottles, grab a snack (the hut crew’s baked goods are delicious), and enjoy the views. When you’ve recovered, take the Crawford Path 1.4 miles up Washington’s summit cone. This portion is above treeline and open to the elements, so before you head up, reassess the weather and layer up. 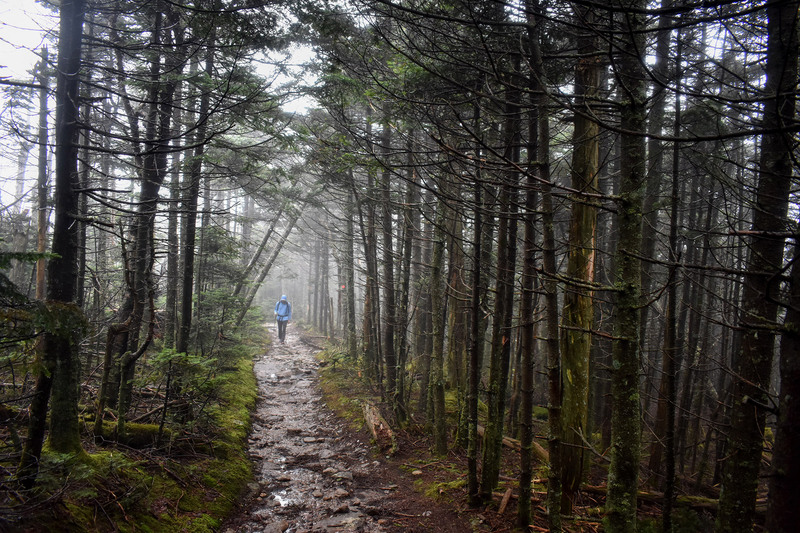 If the weather is deteriorating or you’re just too tired, the summit of Mount Monroe is a relatively easy, 0.3-mile side hike in the opposite direction. The views are almost as good, and it’s a lot less crowded. Pro Tip: With replenishment opportunities at the Lakes of the Clouds Hut and again on the summit proper, this is the route for hikers looking to carry a lighter pack. Distance: 10.2 miles, round trip. Another popular west-side route to Washington’s summit is the Jewell Trail to the Gulfside Trail. Although it’s a tad longer than the route via the Ammonoosuc Ravine (5.1 miles one way versus 4.5 miles) and has a little more climbing (4,000 feet of elevation gain versus 3,800 feet), overall it is a slightly easier route, as the Jewell Trail is neither as difficult nor as steep. The Jewell Trail begins at a trailhead directly across the road from the Ammonoosuc Ravine parking lot and climbs gradually on moderate terrain (at least by Mount Washington standards) up an unnamed ridge on Mount Clay. Near treeline, the views dramatically improve, and the trail gets a little rockier as it nears the intersection with the Gulfside Trail at 5,400 feet. From the junction, hikers have another 1.4 miles on the Gulfside Trail to Washington’s summit. After skirting Mount Clay, the Gulfside Trail hugs the upper rim of the Great Gulf, a massive east-facing glacial cirque framed by the summits of Washington, Clay, Jefferson, Adams, and Madison. 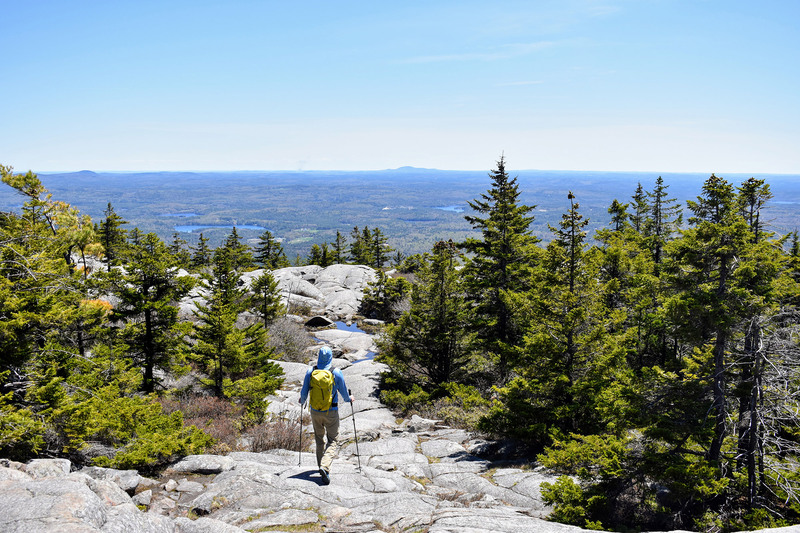 Since it holds the Great Gulf Wilderness, New Hampshire’s smallest and oldest wilderness area, hikers should definitely stop to check it out. 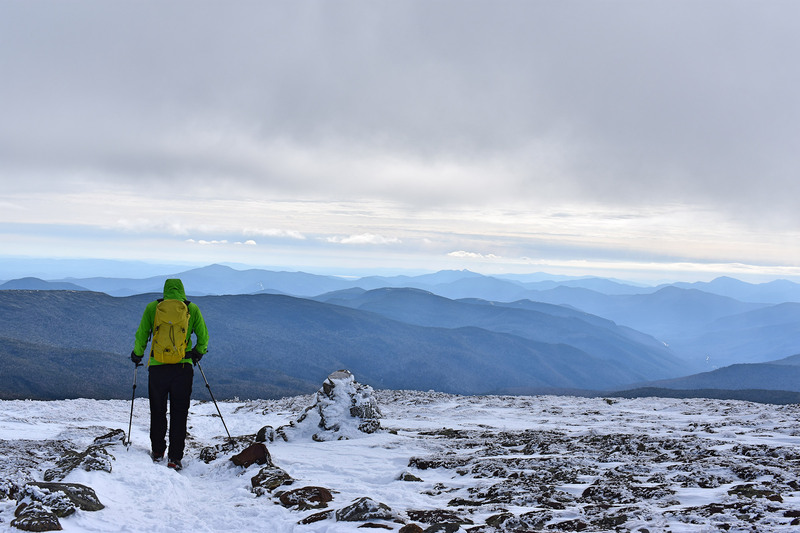 If a simple ascent of Mount Washington isn’t challenging enough, you have numerous popular ways to incorporate summiting Mount Washington into larger hiking objectives. 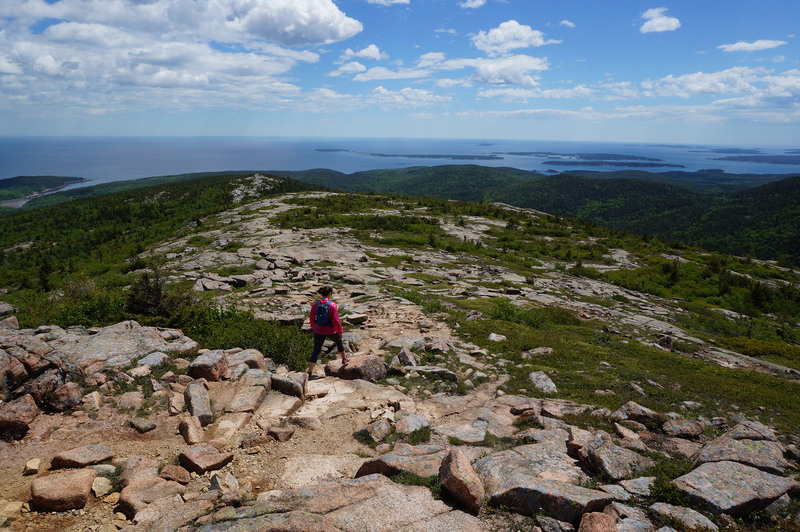 The most notable is the Presidential Traverse, the White Mountains’ classic point-to-point hike. Of course, if a full Presidential Traverse seems too daunting, half Presidential Traverses are also popular. 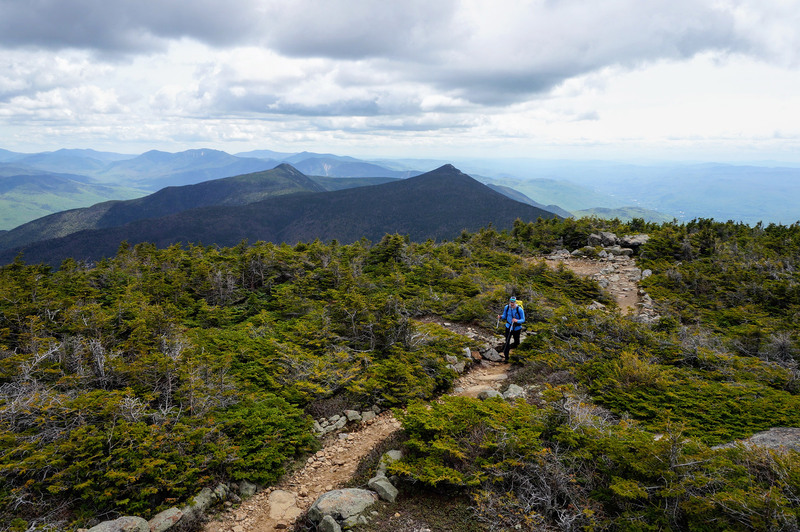 Typically, half Presidential Traverses start from the north (at Mount Madison) or the south (at Mount Jackson or Pierce), and hikers will work their way across the range, which culminates in an ascent of Mount Washington. Another longer, more off-the-beaten path way is via the complete Davis Path. Originally built in 1845 as a bridle path, the Davis Path fell into neglect and disrepair before being re-opened as a footpath in 1910. 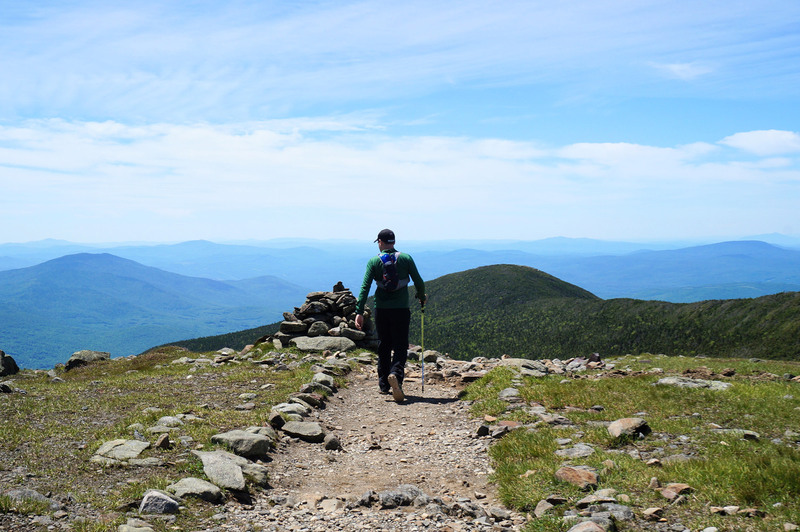 Today, the Davis Path takes hikers roughly 14 miles over Mount Isolation, crossing over Boott Spur, and eventually joining the Crawford Path beneath Mount Washington’s summit. It’s not uncommon for an ascent of Mount Washington to take longer than anticipated. 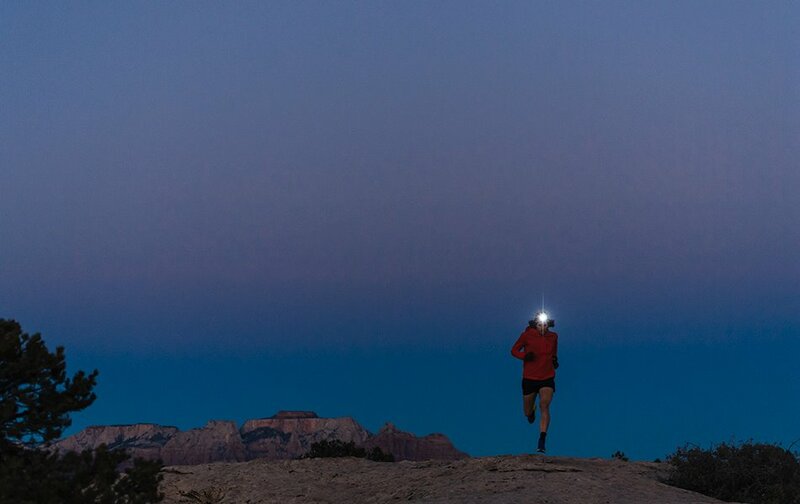 So, bring a headlamp to avoid having to make a death-defying descent in the dark. We like the Black Diamond ReVolt. Spending time on Mount Washington involves a lot of above-treeline hiking, which often leaves you exposed to the sun. The Black Diamond Alpenglow Sun Hoody (men’s/women’s) is an easy way to avoid getting sunburned on your trip. Mount Washington has a well-deserved reputation for being “home to the world’s worst weather.” Prepare for the worst by bringing a lightweight insulated coat, like the EMS Feather Pack Down Jacket (men’s/women’s). The record high temperature on Mount Washington’s summit is 72 degrees. Be prepared for a chilly summit by bringing a winter hat (we like the Smartwool NTS 250 Cuffed Beanie) and gloves (like the Black Diamond Midweight Windbloc Fleece), even on summer ascents. A cold Coke and a slice of pizza from the summit’s cafeteria have saved more than one trip for us, so don’t forget to bring your wallet with cash. Keep your outdoor cred and distinguish yourself from those who drove up or took the train with The North Face Base Camp Wallet. All of the trails on Mount Washington are rugged. Because of this, we always pack trekking poles, like the Black Diamond Distance FLZ (men’s/women’s), for added stability and to reduce the wear and tear on our joints. 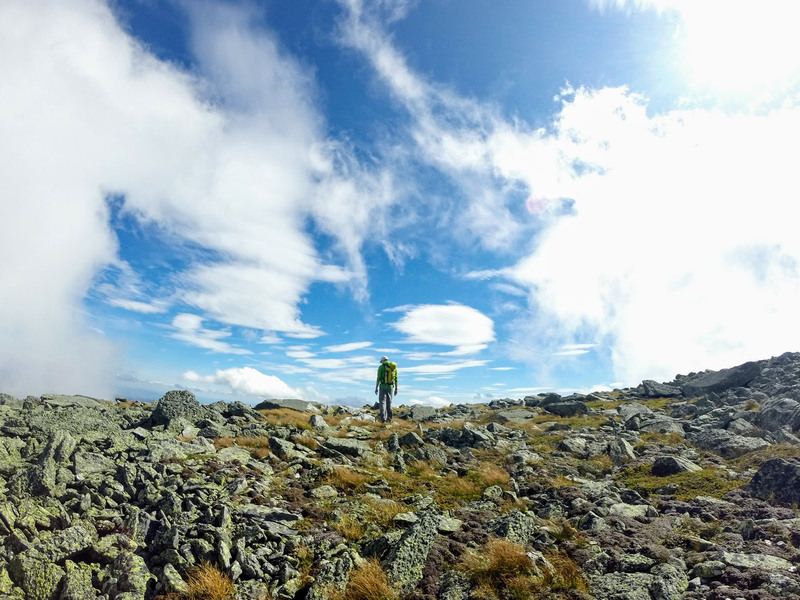 It’s easy to get disoriented on Mount Washington, especially above treeline. Get the Waterproof White Mountains Trail Map, study your route beforehand, and then bring it along—just in case. After a big day on the Rockpile, east-side hikers can cool off with a cold pint from one of Barley & Salt’s 32 drafts on tap in North Conway, while west-side hikers can find cold brews at Fabyan’s Restaurant, conveniently located on the way back to Route 302. Or, stop into a local store, and pick up a six pack of Tuckerman Brewing’s aptly named Rockpile IPA to celebrate when you get home. Let your friends and family know about your successful summit by sending a postcard from the post office located on Mount Washington’s summit. If you’re leaving from Pinkham Notch, make sure to sign the climbing register inside the visitor center, just in case something goes wrong. Any trip to Mount Washington is going to be influenced by the weather. 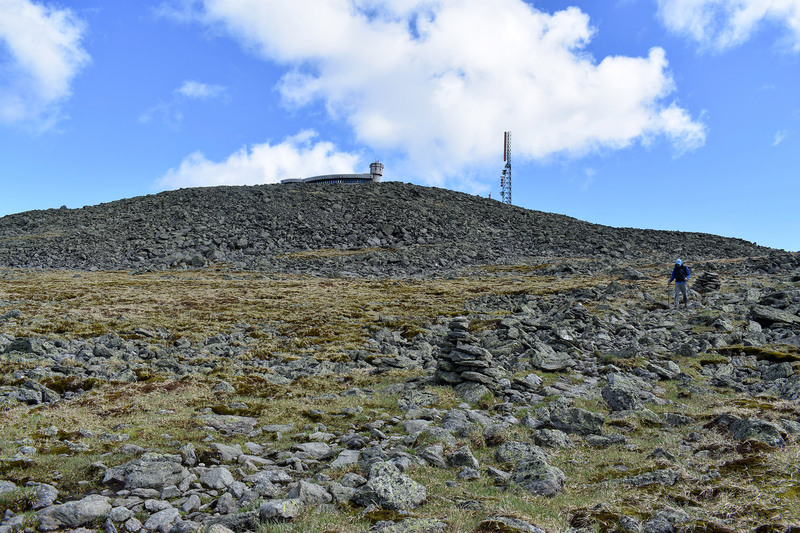 Check the Mount Washington Observatory’s Higher Summit Forecast to know what weather to expect, and read up on how to interpret their predictions. 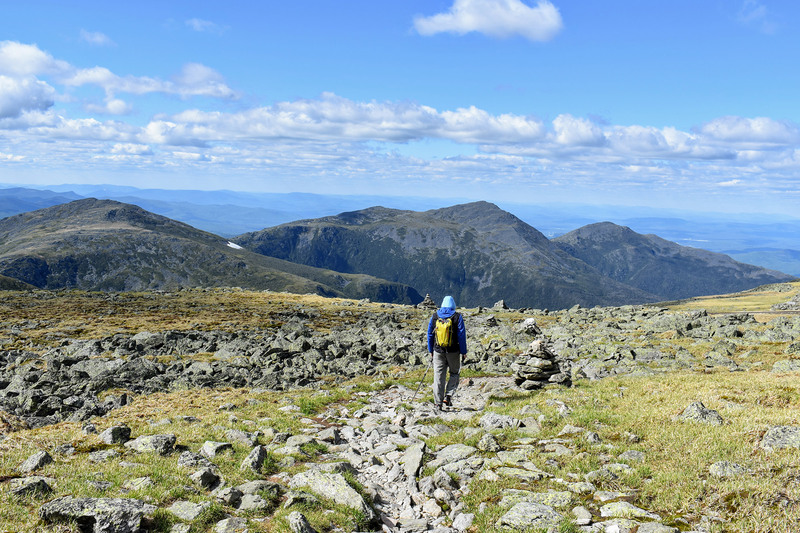 Have you hiked Mount Washington recently? Which route did you use? Post your experience and the conditions (with the date of your climb) in the comments for others! 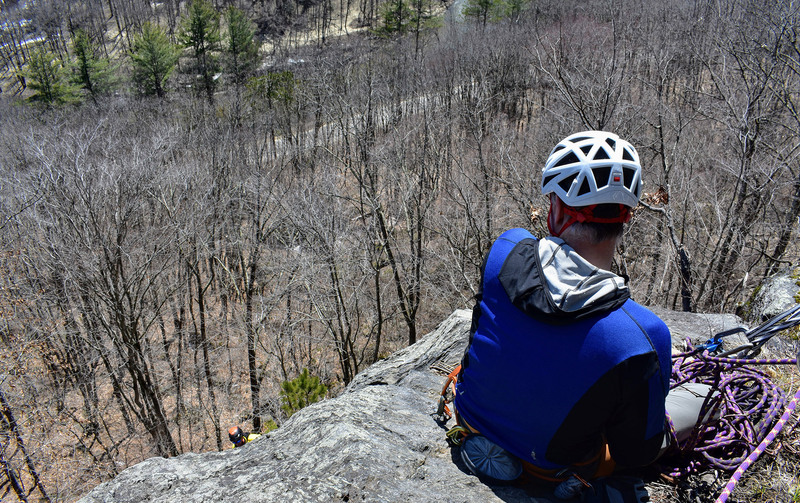 Rumney has a well-deserved reputation as the best sport crag in the Northeast, thanks to its high-quality, single-pitch, bolted climbs at almost every grade. 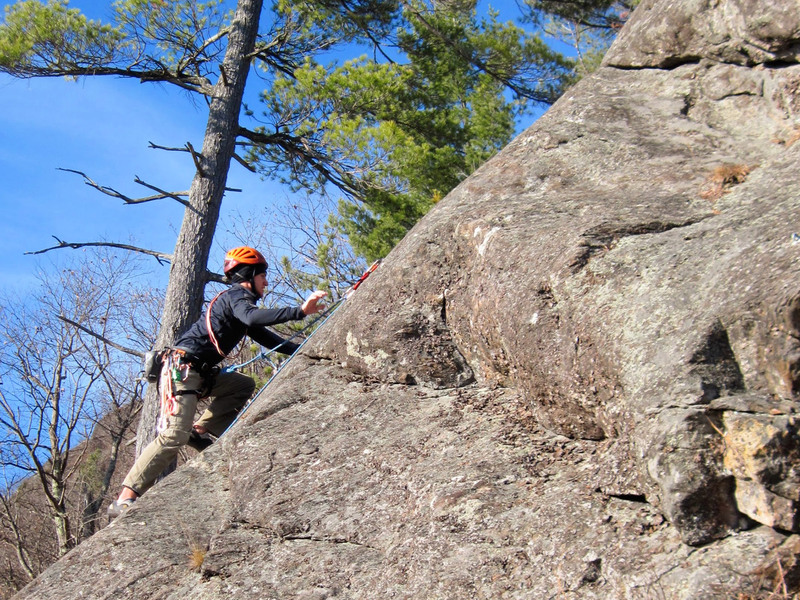 But, did you know that Rumney is also home to a handful of fun, moderate, multi-pitch sport climbs? Here’s a best-of list for almost every grade, along with tips for honing your multi-pitch skills. Don’t discount this remarkable route because of its modest grade. Clip a Dee Doo Dah delivers two pitches of fun slab climbing on surprisingly sticky stone leading to a cliff top with a breathtaking view of the Baker River. This route is so good, you’ll want to bring your approach shoes, so you can make quick time on the trail back to the base of the route and do it again! Clip a Dee Doo Dah is well protected and a fantastic climb for newer leaders. 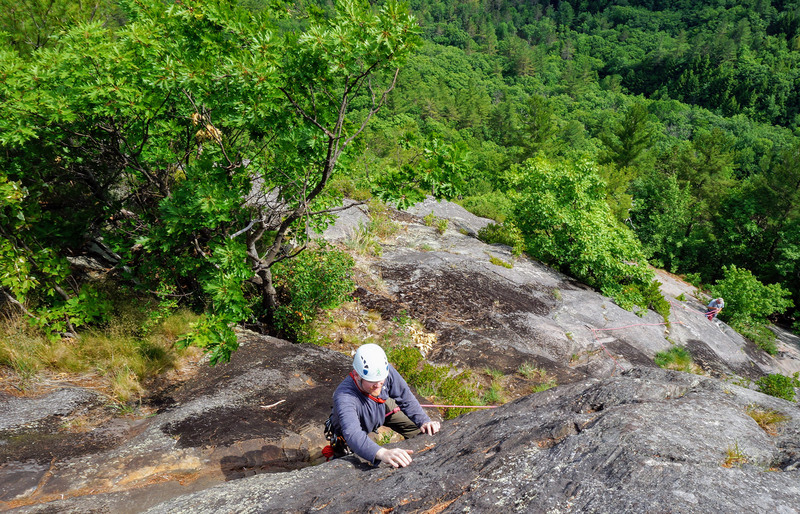 With a two-bolt anchor and decent ledge atop the first pitch, it is also a great place for any climber to practice multi-pitch rope management. In particular, carefully consider where you build your master point and put your belay. Putting it too low may lead to exhausted elbows and a messy rope stack as you try to keep up with your partner charging up the route. Immediately to the climber’s right of Clip a Dee Doo Dah is Lady and the Tramp. It features the same stellar rock found on its popular neighbor, but it’s a little bit steeper and has a few bulges, with the most notable one being directly above the belay at the top of pitch one. It, too, is an excellent route for leaders new to multi-pitch climbing. In terms of skill building, the route presents a great opportunity for recognizing the dangers of falling directly onto the belay. Particularly, watch out for the crux on the second pitch, located just above the first anchor and initially unprotected. Although a fall is unlikely, the consequences are significant. As such, get in the habit of clipping one of the anchor bolts before leaving the belay. Speaking of belays, Clip a Dee Doo Dah and Lady and the Tramp share an anchor atop the second pitch. So, in case it’s occupied, bring a cordelette, so you can build your anchor on one of the many nearby trees. Bonus points for safely extending the anchor, so you can watch your second climb! Model Citizen is a great introduction to Rumney’s more vertical multi-pitch climbing. Featuring huge holds and interesting movement, the first pitch leads to a two-bolt anchor on a modestly sized belay ledge. More of the same type of climbing follows on pitch two. In fact, if you have a 70-meter rope, the two pitches can be combined into one monster-long pitch, albeit with the leader only being lowered to the anchor on the top of the first pitch. A key for this route—and the others that follow—is that the top of the final pitch is not intended to be a belay station. Rather, the leader should build an anchor, clip the rope into it just like on a regular single-pitch sport climb, and then get lowered back to the first-pitch anchor. The second can then clean the route and anchor, before being lowered back to the first-pitch anchor. From there, the parties can do a single-rope rappel to the ground. Have questions about the best way to rappel? Check out tip 2 and the associated video in this goEast article. Another fantastic multi-pitch route, Crowd Pleaser begins a few feet to the right of Model Citizen in a left-facing corner. After an awkward first move or two, the route continues on good holds to an initial two-bolt anchor, for those wanting to top-rope the first pitch. 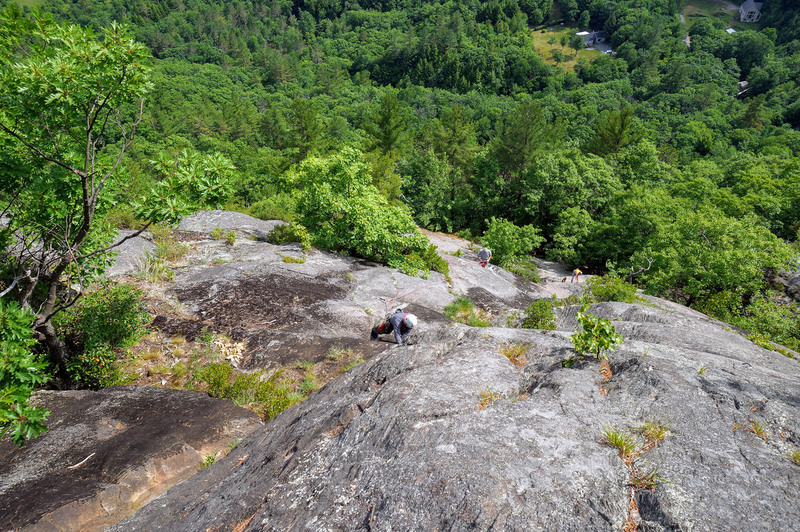 Assuming you’re doing both, keep climbing just a little bit higher to the top of the first pitch. Here, there’s another two-bolt anchor with a nice ledge to belay from. The second pitch begins as low-angled slab before turning into fun, exposed climbing on the arete. Pigtails, otherwise known as ramsheads, have been a popular option for equipping lower-offs in Europe for years. 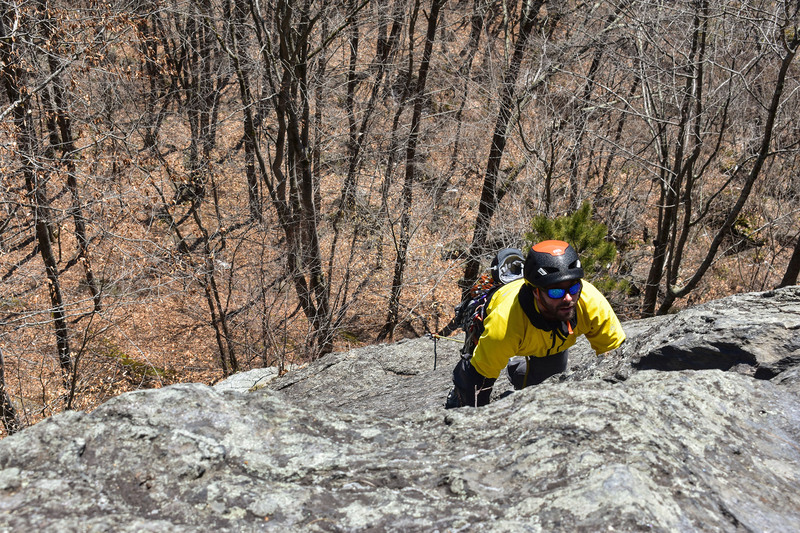 Inexpensive, robust, and easy to use, they are becoming a more common sight at Rumney, thanks to a grant from the American Alpine Club and the Access Fund. And, unlike other top anchors, they are certified and tested for use as a lower-off—a pigtail is rated to 18kN. Plus, they have no moving parts to wear out or rust. Want to learn more about using the pigtails found at Rumney? Check out this fantastic video the Rumney Climbers Association published. The hardest move on the first pitch of this juggy gem of a route might be the first one. So, consider having your belayer spot you until you make your first clip, or you could face a long tumble down the hill. 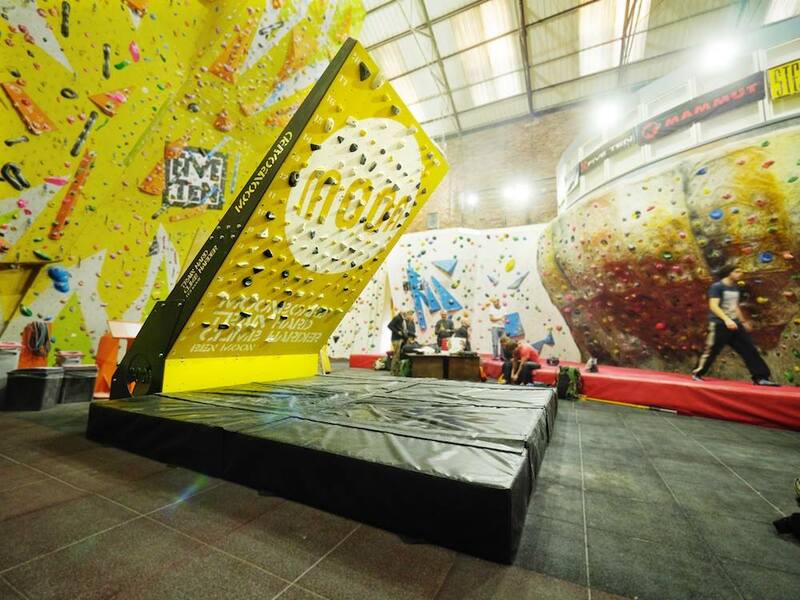 Tipping Point’s first pitch is filled with dreamy climbing, once you unlock the hidden holds, and it ends at a huge belay ledge. Build an anchor, bring up your second, and then continue up. The crux comes at the top of the second pitch, where the slab turns vertical. Although it can feel challenging compared to the rest of the route, the holds are all there, the climbing is fun, and the position is fantastic. The anchor on the first pitch is the perfect place to practice using the quad anchor. The quad is our go-to anchor on two-bolt anchors, and if you’re unfamiliar with it, check out this excellent video from the AMGA showing you how to use it. If you’re looking to beat the crowds on Model Citizen, Crowd Pleaser, and Tipping Point, check out Charity Toad. This three-pitch climb is the hardest of the Main Cliff Right’s multi-pitch routes, connecting Charity Case with the final pitch of White Toad via a short traversing pitch. White Toad’s final pitch is airy and very exposed—and definitely worth checking out. Since you can access several climbs from the top of the first pitch, and the route’s second-pitch traverse crosses at least one more, Charity Toad’s first-pitch belay anchor is a great place to sharpen your route-finding skills. In addition to reading the guidebook, consider taking a screenshot of the route description and map with your smartphone. That way, you’ll have all the beta with you while you’re climbing the route. Of course, if you want to minimize any potential route-finding confusion, just climb the first two pitches of White Toad instead. But, since White Toad’s first pitch only goes on gear, you’ll have to bring your trad rack. Have you climbed any of aforementioned routes? Tell us which one is your favorite in the comments. Bright colors are our thing. We stuff our gear rooms with the loudest lenses, the most colorful kicks, and the most scintillating shells. And, we’ve even impulse-bought everything from ropes to packs because we were dazzled by their colors. Needless to say, after reading the recent Outside magazine article “Yes, Running Clothes Are Hideous,” we’re ready to defend them. If you haven’t had a chance to read it, the piece touches on how ridiculous certain outdoor gear looks in everyday use. Particularly, the writer hammers away at the super-bright colors covering today’s running attire. For us, however, bright colors are fun. So, when we pursue hiking, climbing, skiing, and other activities for enjoyment, why not let our outdoor wardrobe reflect our happiness? Sure, a black hardshell can probably do double duty on those rainy days when you commute to your “real job,” but it’s boring. Instead, try a bright yellow one. It screams “fun” and may even give you something to smile about. Want people to like those outdoor pics you spend so much time shooting? Think about the colors your subject is wearing. They’re often the difference between whether a photo pops off the screen or simply gets scrolled by. Don’t believe us? Check out Outdoor Research’s “One Tip to Improve Your Buddies’ Outdoor Photos.” You can probably guess what that is. Sure, a black hardshell can probably do double duty on those rainy days when you commute to your “real job,” but it’s boring. Bright colors are also safer. Particularly, they stand out in a natural setting. 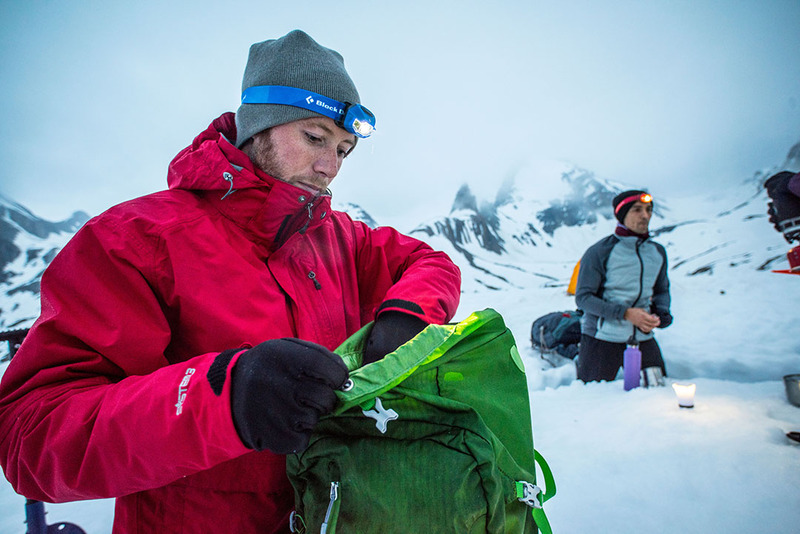 So, thanks to that vivid orange jacket, you’ll be more easily spotted, whether by friends lagging on the trail, skiers speeding down the hill, or bystanders watching you send that five-star climb. On this note, bright colors attract way more attention in an emergency than dark colors. Finally, let’s be honest. You’re way more likely to find an awesome deal on a must-have puffy in an absurd color than you are in something more neutral. So, embrace your inner dirtbag and save a few bucks for your fall climbing trip, even if you end up looking like the Kool-Aid Man. As children of the ’80, we are likely biased, too. After all, those neon onesies worn by the decade’s ski icons and the insanely patterned tights of the era’s leading climbers heavily influenced us. For outdoor athletes, it’s easy to get lost chasing first tracks, climbing grades, and waves. But, don’t forget to keep chasing the most important thing. See you out there. Hopefully, you’ll be so bright, we can’t help but spot you. 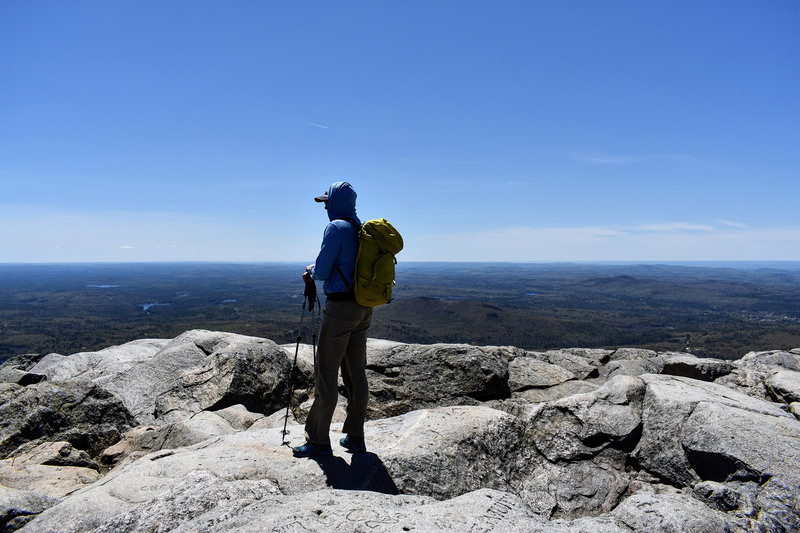 For many Northeast-based hikers, becoming a member of the AMC Four Thousand Footer Club (NH 48) or the Adirondack 46ers (ADK 46ers) represents the pinnacle of achievement. But, sneaking under the radar—and elevation—of these two illustrious groups is the Catskill 3500 Club. Organized peakbagging came late to the Catskills. In 1962, the Catskill 3500 Club was formed to encourage hiking in the region—roughly a quarter-century after the 46ers of Troy Hiking Club and five years after the AMC Four Thousand Footer Club. Members have summited the 35 Catskill peaks over 3,500 feet in elevation, plus Slide, Blackhead, Balsam, and Panther mountains again in winter. 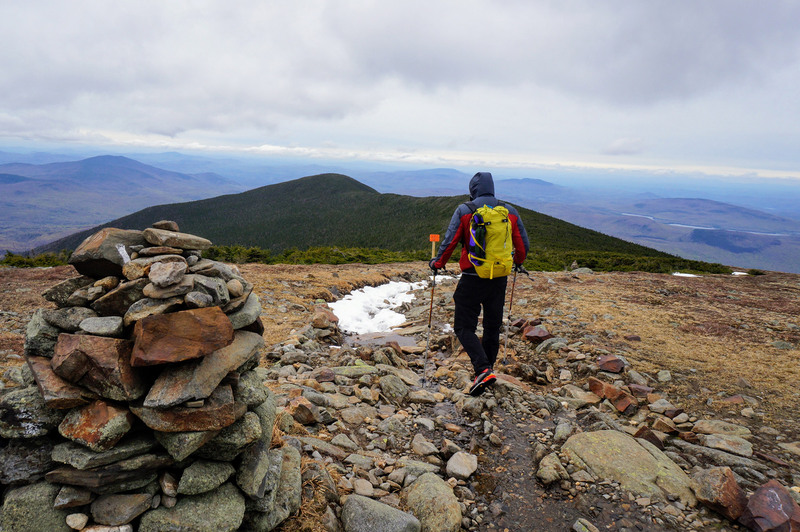 Although the majority of these fall shy of the 4,000-foot marker used as a baseline for the other ranges’ high peaks, two Catskill summits meet the cutoff, Slide Mountain and Hunter Mountain. At 4,180 feet in elevation, Slide Mountain is the tallest of the Catskill high peaks. If it were in New Hampshire, it would tie with North Tripyramid for the 32nd-tallest mountain. In the Adirondacks, it would be the 30th-tallest—nestled in between Big Slide Mountain and Lower Wolf Jaw. Although Slide is recognized as the Catskills’ tallest peak today, that was not always the case. Because high peaks surround it, Slide is difficult to see from afar, and throughout the mid- to late-1800s, few knew it existed. As well, hotel owners in the northern Catskills refused to acknowledge its prominence. Even after its height was confirmed, they were afraid it would hurt their business. Those early hotel owners had a right to be concerned, however. 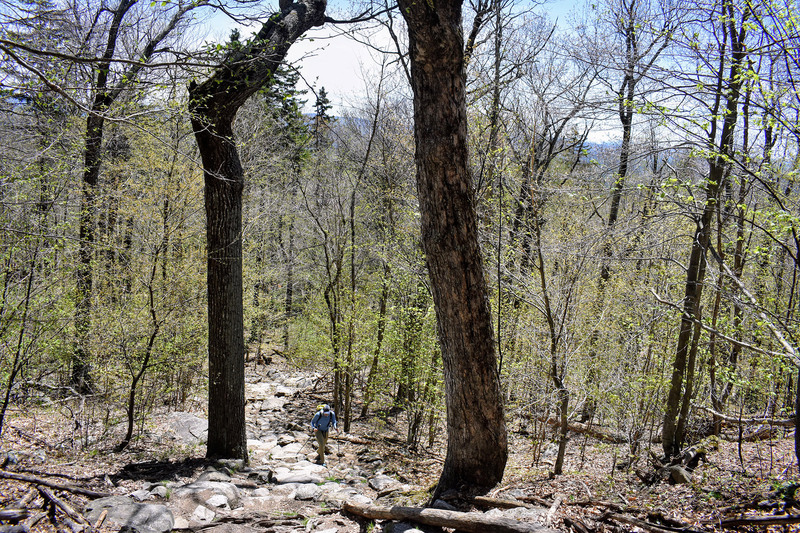 Today, a trek to the summit is one of the Catskills’ most popular hikes. The most direct and favored route is via the Phoenicia-East Branch Trail and the Wittenberg-Cornell-Slide Trail. Leaving from a well-marked and obvious Phoenicia-East Branch Trailhead located off State Road 47, the hike reaches its crux just moments after leaving the parking lot. Here, you’ll encounter a stream crossing—especially challenging after rain or when the snow is melting. Fortunately, the difficulty eases after. 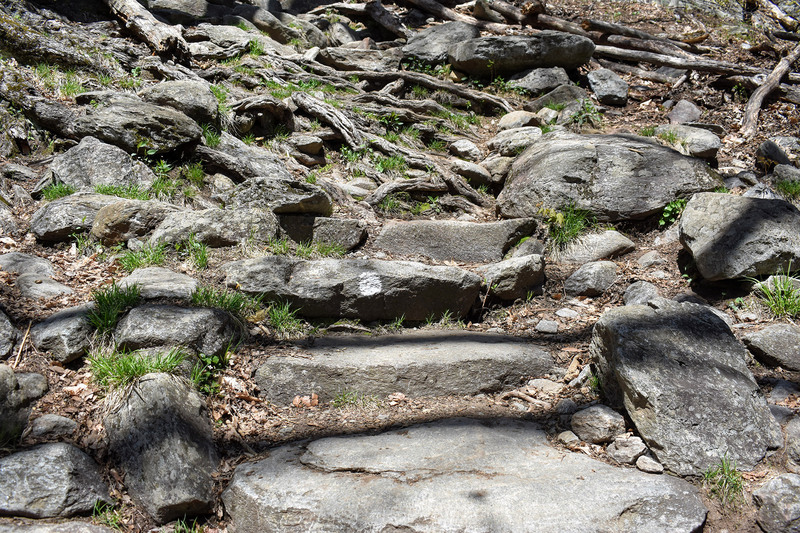 The trail gently ascends the approximately 1,700 feet of elevation to the summit, first following the very moderate Phoenicia-East Branch Trail and then connecting with the Wittenberg-Cornell-Slide Trail at a well-marked junction. You’ll get great views from the Wittenberg-Cornell-Slide Trail as it approaches the summit, so make sure to stop and enjoy them. You’ll also pass a nice slabby overlook a few minutes past the summit. The summit itself, however, is wooded with no view to speak of. 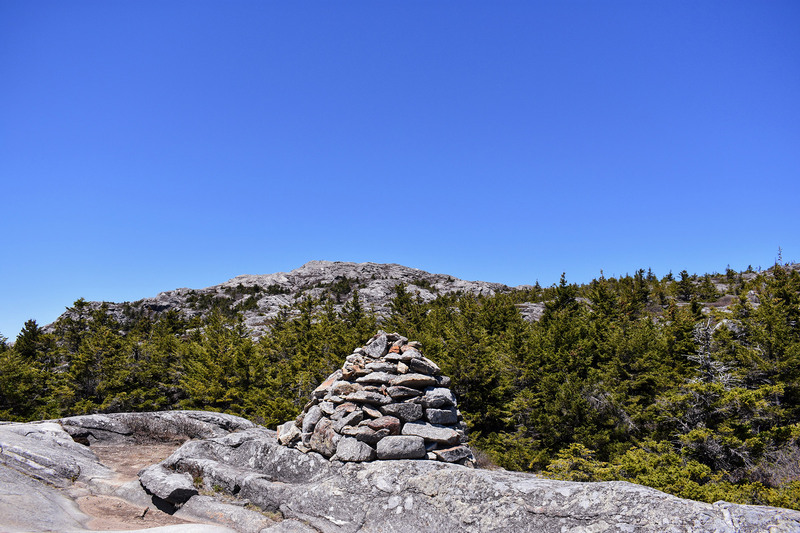 On the summit, inquisitive hikers may locate a few concrete pads—remnants of an old fire tower. Also, a large rock that graces Slide’s summit features a plaque dedicated to the poet and naturalist John Burroughs. In fact, Slide Mountain lies within the Burroughs Range, named after the famed author. The most direct way up Hunter Mountain is to take the Becker Hollow Trail. Starting in a small parking lot off Route 214, the trail meanders on somewhat flat ground through a forest, before climbing steeply up. As you gain elevation, make sure to turn around and admire the mountains to the east. You’ll come across a few good spots for views and will have time to catch your breath. After about 1.8 miles, you’ll arrive at the junction for the Hunter Mountain Trail. Stick with the blue blazes of the Becker Hollow Trail, and you’ll gain the summit plateau in about another 0.2 miles. As it crests the plateau, the Becker Hollow Trail opens into a large clearing with a trail junction. Although the Becker Hollow Trail continues straight, the easiest way to the summit is to turn right onto the Becker Hollow Connector Trail. 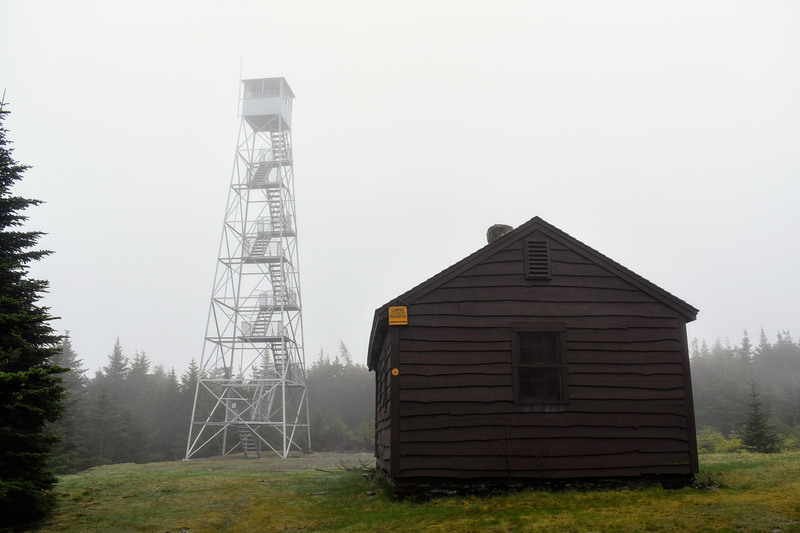 Here, walk on flat ground a short distance to the true summit (at 4,039 feet) and then over to the Hunter Mountain Fire Tower and ranger’s cabin. At 60 ft. tall, Hunter’s tower is the tallest fire tower in the state of New York. As well, it’s one of the few fire towers listed on both the National Historic Lookout Register and the National Register of Historic Places. Locally, it was one of the Catskills’ last staffed fire towers, officially closing in 1989. 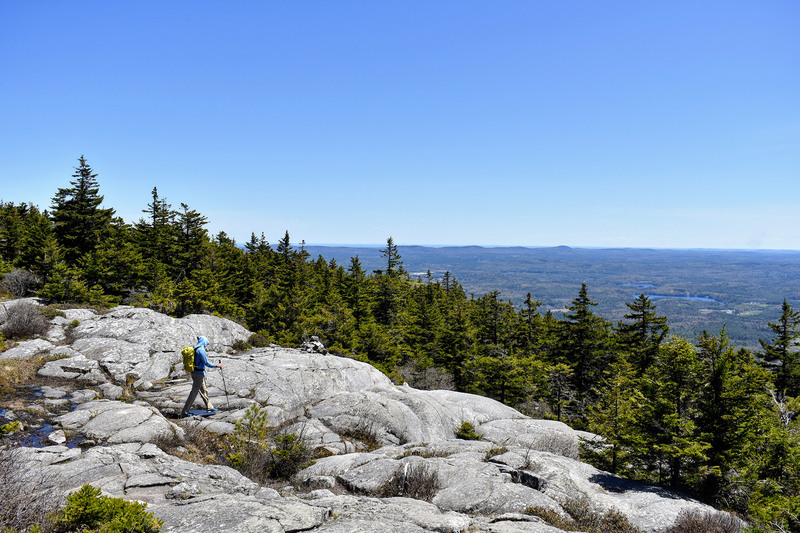 On clear days from the fire tower, hikers can take in spectacular views of the Hudson Valley, Massachusetts, Connecticut, and even southwestern Vermont. Just be forewarned: The room atop is typically locked, and the tower’s stairs are steep and not for everybody. 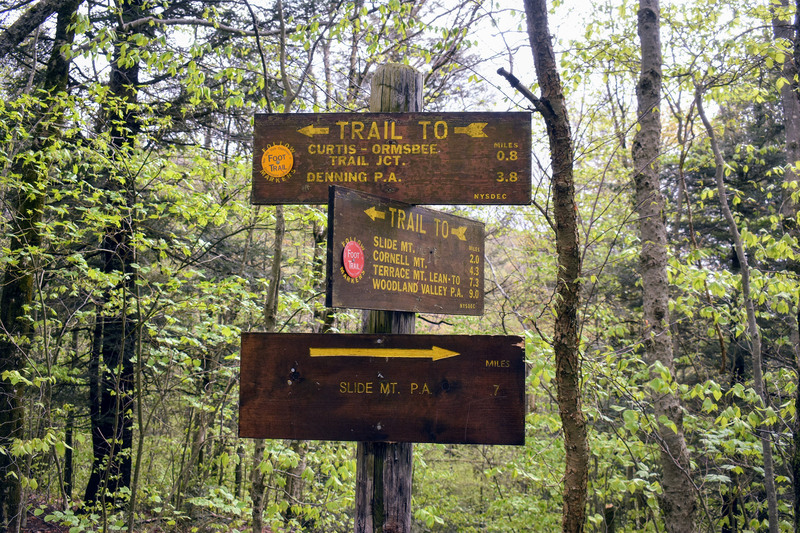 After enjoying the views and having a well-earned snack, follow the yellow blazes of the Hunter Mountain Trail to loop back to a lower junction on the Becker Hollow Trail. Then, retrace your steps back to the parking lot. For many peakbaggers, it’s possible to summit both Hunter and Slide on the same day—perfect for those looking to check two new 4,000-footers off their lists or get a jump on becoming a member of the Catskill 3500 club. Even better, both Slide and Hunter are included on the NE 111 list. In total, the list includes the 67 New England 4,000-footers, the 46 Adirondack 4,000-footers, and these two Catskill Peaks. Have you hiked Slide Mountain, Hunter Mountain, or any of the other Catskill 3500? If so, what has been your favorite trip? While we’re always psyched on climbing, the sad reality is you don’t always have enough time to visit the crag, boulders, or even the gym—especially during the work week. Lucky for us, there are numerous ways to stay strong and build climbing fitness without leaving the house. Try some of our basement beta, and you’ll realize that training in the home gym during the work week can translate to sending on the weekend. Hangboards are one of the most popular at-home training aids. While that might be because they’re small, easy to mount, and inexpensive, these devices are also very effective. Climbers literally hang from a variety of different-sized pockets and holds to build finger strength. As a side note, this is why hangboards are also sometimes called fingerboards. Although less climbing-specific, a pull-up bar suits anyone who wants to take a break from their fingerboard, rest sore fingers, or simply work larger muscles. In fact, you can use it in all manners to build climbing strength. To start, the classic pull-up is a great exercise for increasing pulling power. Then, Frenchies—pausing to lock off at certain angles through the movement of a pull-up—are a fantastic method for building endurance and simulating the pause climbers take when clipping a bolt or placing gear. Allez! No room for a hangboard? Don’t have a wall you’re comfortable drilling into? Live a life on the go? If you answered yes to any of these questions, rock rings may be the best solution. Used as a pair, these individually molded grips are suspended using a cord that can be hung from any number of anchors. Think about a basement beam, a backyard tree, or even a swing set at the local park. 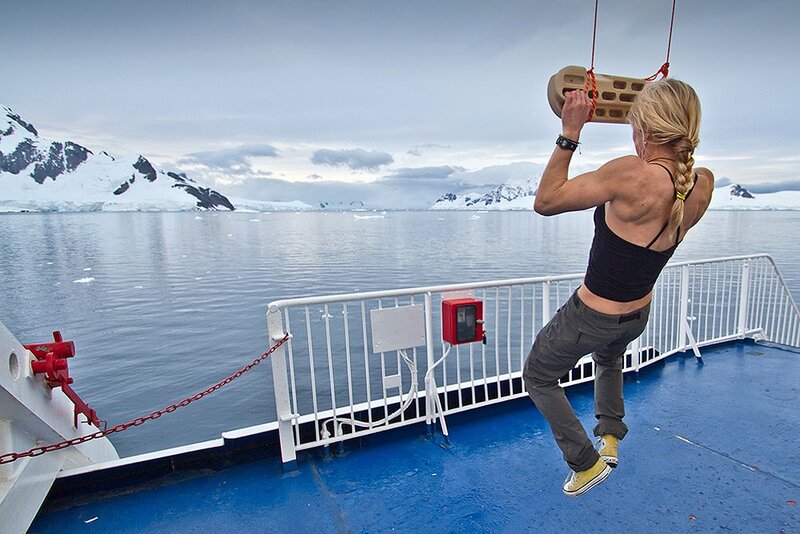 Although lacking the diversity of a hangboard, rock rings let you move freely. In turn, the motion places less strain on your joints compared to doing pull-ups or Frenchies, which involve a fixed position that may be hard on the elbows. If you have a bit more room available, consider a campus board. Wolfgang Güllich devised its simple, utilitarian, and effective design to train for sending the world’s first 9A, Action Directe. On a series evenly spaced rungs on a slightly overhanging wall, climbers move up and down without using their feet to primarily build power. Additionally, you can increase finger and core strength and improve accuracy when moving between holds. 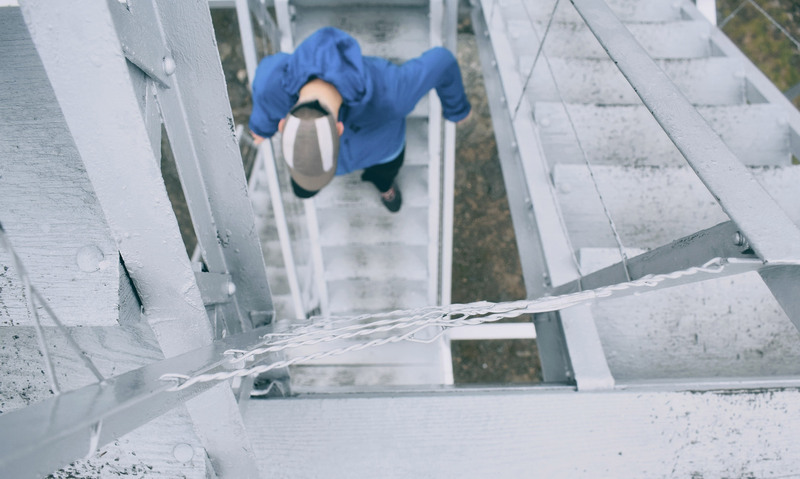 Because of the physical demands, it’s not recommended for new or young climbers. Climbers looking to crush cracks can build a crack machine to practice technique and gain strength. Simple and easy to construct, crack machines feature two stiff wooden boards mounted to resemble a crack. And, while advanced constructors will create adjustable machines, most basement builders will find it easier to create multiple cracks in the sizes they want to train—primarily finger and hand. The best part is, a little goes a long way, and you can climb both up and down when training. For those with room to spare, a home wall is the way to go. From mild to wild, a home wall can range from a simple mounted piece of plywood to a full build rivaling the rock gym. Whether it’s freestanding or mounted to the wall, the most important components are the holds. Consider a wide variety of shapes and sizes for increased diversity and fun in setting. Overall, the best home walls tend to be the most frequently used ones and ultimately do their job—getting you strong for climbing. 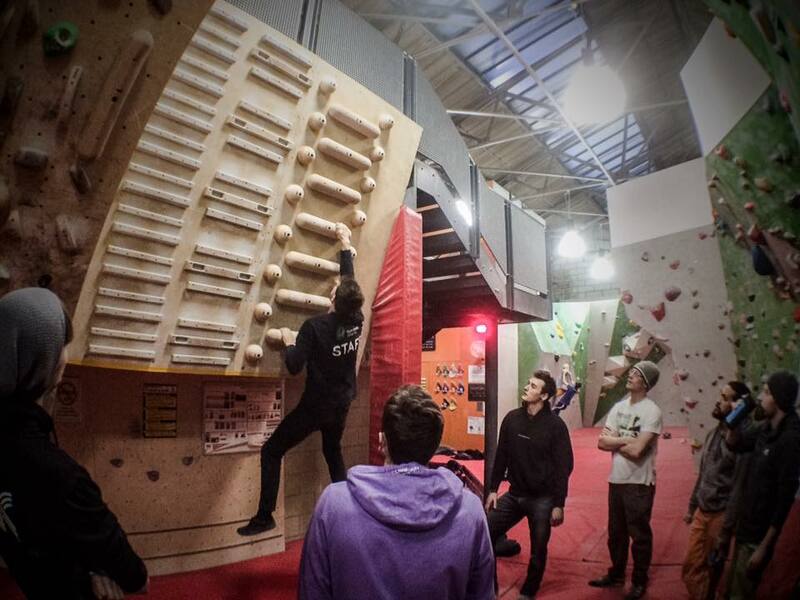 For pro climbers and those truly dedicated to getting strong, try a Moon Board. Back in the ‘80s, legendary U.K. climber Ben Moon devised the first Moon Board in his basement in Sheffield, England, and by the 2000s, the trend had caught on. Compact and simple in design, Moon Boards have a uniform size and configuration: 8.06 feet wide, 10.40 feet high, and positioned at a 40-degree angle. The holds are placed in fixed locations, creating a wall that is the same, no matter where it’s located. Because of the universal layout, it’s possible to project the same route as your buddy across the country, or your favorite pro climber. As such, serious climbers can find thousands of established problems posted on moonboard.com and the MoonBoard App. Even better, with the addition of an LED system, you can download and illuminate the problems to make route finding easier. Strong fingers and abs only get you so far, especially if your training plan is haphazard, your mental game is lacking, or your technical skills are weak. If any of that rings a bell, check out one of these books for training your brain. 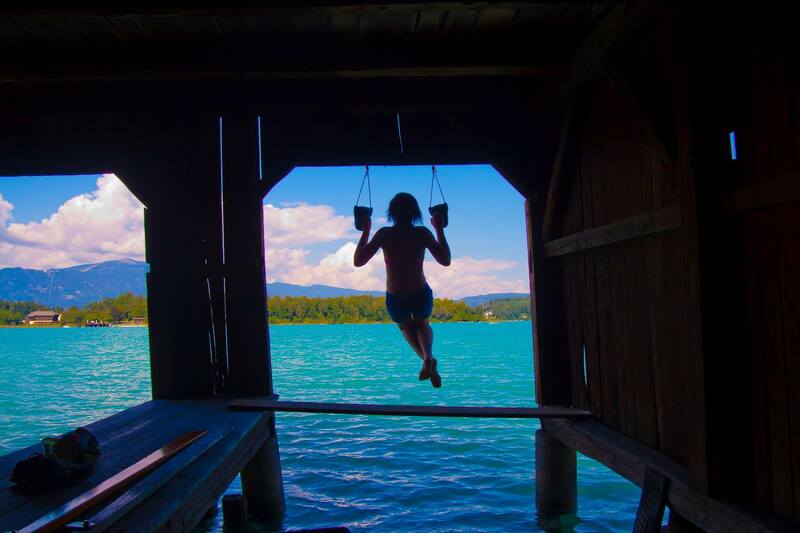 If you have the hangboard or home wall but are unsure of how to best use them, The Self-Coached Climber offers excellent advice for developing your own training plan. And, for something even more programmed, check out the training plans available from Uphill Athlete and the Mountain Tactical Institute. For climbers truly looking to train their mind, The Rock Warrior’s Way is an insightful read about mental training. The Mountain Guide Manual: The Comprehensive Reference—From Belaying to Rope Systems and Self-Rescue is an incredible technical skills guide that will greatly improve your climbing systems’ efficiency. Practice them at home, and you’ll find that you’ll have a lot more time to spend sending at the crag next weekend. Have a training technique we didn’t mention? If so, tell us about it in the comments. Getting the stand-up paddleboard that’s “right” for you can mean the difference between falling in love with the sport and having another expensive piece of equipment gathering dust in the garage. Since SUPs come in a variety of lengths, widths, and shapes, we’ve created this simple guide to demystify the board buying process. Read on for some helpful tips to find the one that’s ideal for you. Before shopping for an SUP, consider how you intend to use it. Whether you’re using the board for touring, surfing, yoga, whitewater, or just family fun, knowing its intended use simplifies the process, as boards feature designs unique to each activity. Not sure about your intended use? Consider an all-around board. They’re the perfect choice for someone who wants to do it all. Better yet, if you later decide that you want an activity-specific board, all-arounders are great to have in your quiver, as you can lend one to a paddling partner. Walk through the paddle shop at any EMS, and you’ll notice that some SUPs look very different from others. Some are long with ample deck space, while others are short and have an increased rocker. Here are some basic ways to understand the differences. First, the longer a board is, the faster it will glide through the water, and the easier it will be to paddle in a straight line. Because of this, touring and racing SUPs tend to be longer. But, these are also less nimble, and for an activity like surfing, you’d want a shorter board. Second, the wider a board gets, the more stable it becomes. Wider options are therefore popular with new paddlers, who are still building confidence balancing on the board, and with tall paddlers, due to their high center of gravity. Just be forewarned: The wider a board gets, the slower it moves through water. Third, the larger the volume, the more weight an SUP supports and the more buoyant it is. Almost every manufacturer posts a weight limit for their boards, and it’s important to note. Just be sure to factor in not only paddler weight, but also everything you’ll carry on board. For example, will a child or dog be riding with you? What about gear? If you fail to account for these factors, you could find your SUP sinking below the water. SUPs also have two different types of hulls: planing and displacement. Those with planing hulls, similar to the Surftech Universal CoreTech, look like a traditional surfboard and ride on top of the water. Planing-hull boards represent the majority stocked at EMS, and handle everything from surfing to all-around use. 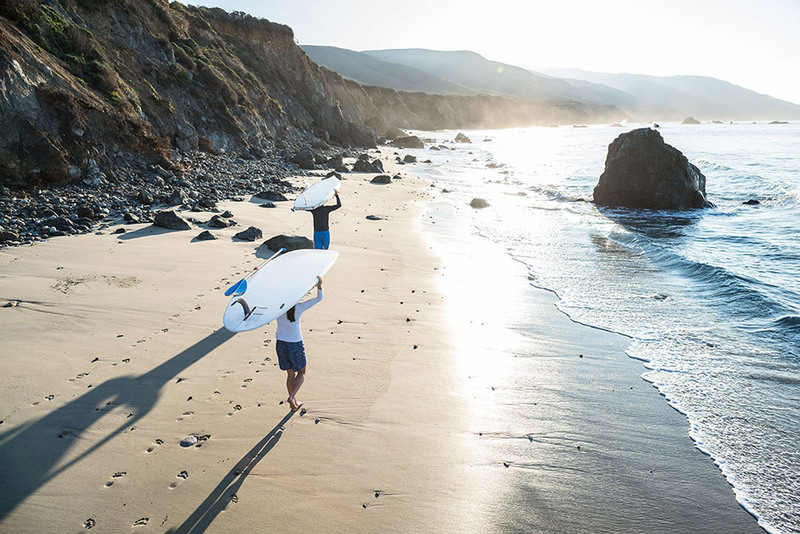 Boards featuring displacement hulls, like the BIC Ace-Tec Wing, take their cues from kayaks. Particularly, they’re shaped to push through the water, rather than ride on top of it. Popular with those who want to tour or race, these SUPs are more efficient at moving through the water. Thus, you’ll get a faster speed and cover greater distances. As the main drawback, they are less maneuverable and playful than SUPs with planing hulls. Some companies blend the two types—for example, the BIC Cross. 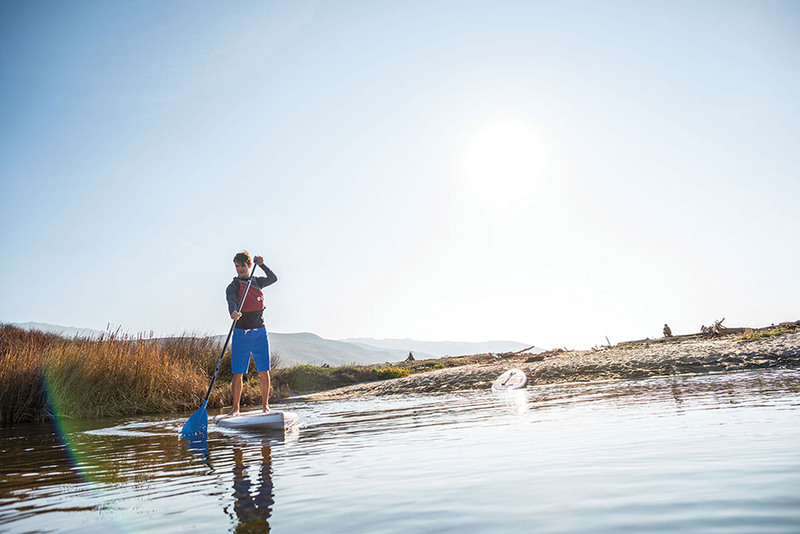 These hybrids suit recreational paddlers, as they offer the speed and tracking of a displacement hull with the stability and playfulness of a planing board. Stand-up paddleboards are constructed in three different ways—solid, soft top, and inflatable. Each method has its unique characteristics. Borrowing from traditional surfboard construction, solid boards feature a foam core wrapped in fiberglass and epoxy resin. As the most common type of SUP, these deliver a fast and smooth ride when compared to other compositions. Because of their popularity, solid boards typically have the widest variety of available shapes and sizes. They even offer more material variations. In fact, it’s not uncommon to see wood and carbon fiber replace fiberglass in higher-end models. 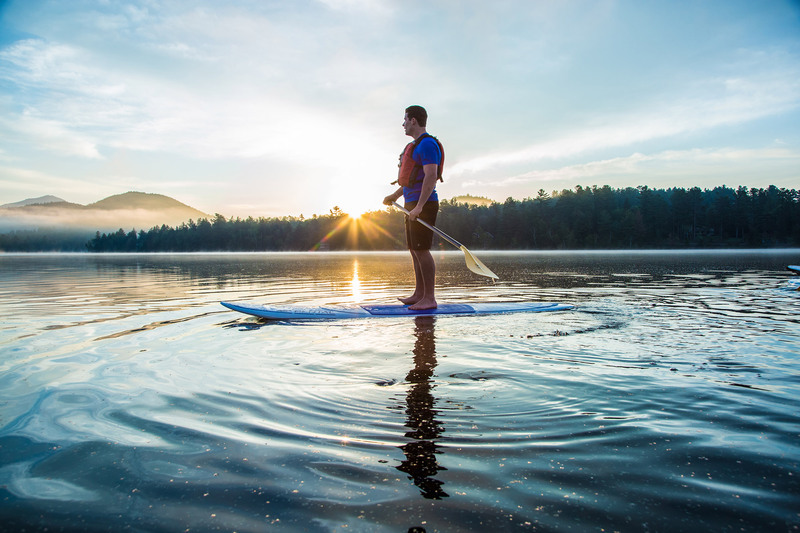 Soft-top paddleboards, like the Perception Jetty, are a popular option for many first-time and recreational paddlers. Much like solid boards, these feature a foam core; however, it’s wrapped in soft fiberglass. Usually less expensive and more durable than solid boards, they provide a more comfortable platform. If you happen to fall, they also give you a better landing. Inflatables, like the NRS Thrive , are a common alternative to solid boards. 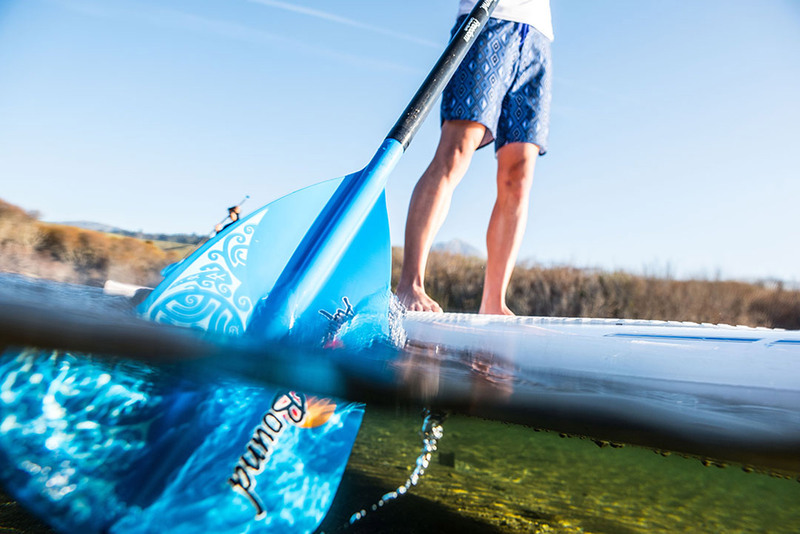 Inflatable stand-up paddleboards feel almost as rigid but are far less susceptible to dings and dents. Additionally, the design solves a few other issues posed by traditional boards, including portability and storage. Particularly, you can deflate and stash one in the trunk of your car for transporting, or tuck it into a closet when it’s not in use. Fin size and alignment also influence a board’s paddling characteristics. Today, a single fin is the most common configuration, and for fin adjustments in relation to performance, two simple rules apply. The first is, longer fins provide more straight-line stability, thus making them popular with newer paddlers. As such, shorter fins generally deliver more speed and better maneuverability. Secondly, the farther back you place the fin on your board, the more stability it will provide. Conversely, the closer the fin is positioned to the nose, the faster the SUP will be. Many SUPs today are further manufactured with slots for side fins, also called thrusters. Although some paddlers will opt to use side fins for flat-water paddling, they increase your board’s resistance, thus making it slower, and are best left off. If the paddleboarding bug bites hard, you could find yourself spending a lot of time standing on your board. Although it’s not essential, a high-quality deck pad can go a long way toward your comfort. Especially for yoga, a full-length deck pad should be considered. In all cases, a deck pad also increases traction on your board, making it easier to stand on. You’ll need a few additional items before you head out. Of primary importance, a paddle is essential if you want your SUP to move. In fact, having a good paddle is one of the best ways to increase your board’s performance. A quality adjustable paddle can move with you from board to board, and can be used as a loaner when you decide it’s time to upgrade. Wearing a PFD isn’t just a good idea—it’s also the law. High-end personal flotation devices are designed to stay out of the way when you paddle, making them infinitely more comfortable than the life jackets of yore. Also gaining in popularity for paddleboarders are inflatable PFDs. These clever devices look like waist packs, deliver a barely-there feel, and can be inflated in the event of an emergency. Lastly, get yourself a leash, so that you’ll stay connected to your board when you fall off. Nothing screams newbie more than swimming after a rogue paddleboard, and it would be a shame to see your new board float away. Still not sure about what you want? Keep your eyes out for a demo in your area to try a few different boards. 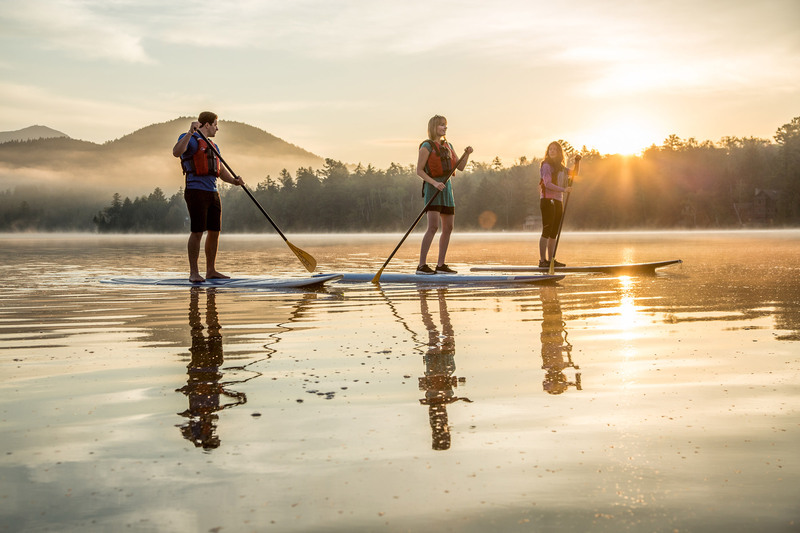 Better yet, schedule a lesson with the Eastern Mountain Sports Kayak School to get some paddling pointers as you pick the brain of someone who makes a living on the water. Spring can be a challenging time for mountain bikers. We’re anxious to resume riding, but unpredictable weather often leaves trails muddy and impassable. Thankfully, some popular destinations dry faster than others. So, if you have the need to ride but your local spot isn’t quite ready yet, check out these locations. With sandy, dry soil and mild winters, Trail of Tears in Cape Cod’s West Barnstable is the perfect place for logging early-season mileage. 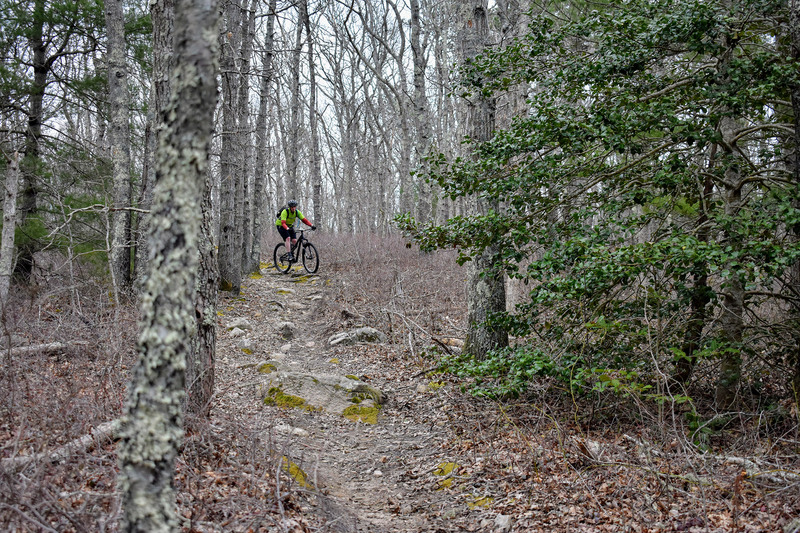 Offering a 20-plus mile trail network on a large parcel of conservation land, it features fun, mostly fast, and flowing non-technical singletrack, with twists and turns through a classic Cape Cod forest. Riders will also come across occasional boulders to roll over and small rocks to jump off along many of the trails. Just be ready for the occasional short, steep hills, which often leave even the fittest riders gasping for breath at their crests. As you cruise around Trail of Tears, it’s easy to get lost in the rhythm and forget you’re even on the Cape. The woods are immersive, and stopping at the observation deck at the top of the North Ridge Trail reinforces this, as no beaches, traffic, or roads are in sight. It’s almost as if you’re in the woods of Vermont, New Hampshire, or Maine. Of course, if you’re worried about getting lost, you shouldn’t be. NEMBA hosts rides on both Wednesday and Friday nights, allowing you to get a free tour. However, if you can’t make it, here’s a map. And, because Trail of Tears is the home turf of many Cape Cod NEMBA members, the trails are impeccably maintained, so you can let it rip. 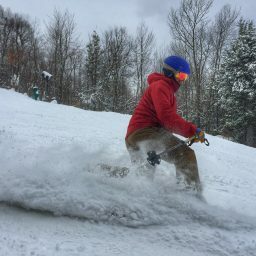 Located a short drive over the Bourne Bridge, Otis is one of New England’s best early-season riding destinations. While nicknamed after its proximity to Otis Air National Guard Base, the spot is actually located within the Town of Falmouth’s conservation lands and the Frances A. Crane Wildlife Management Area, rather than on the base itself. And, if it weren’t for the hordes flocking to the Cape between late May and August, Otis could be a bonafide summer biking destination. While very similar to Trail of Tears, Otis takes everything up a level. The singletrack is slightly rootier, rockier, and more challenging. More so, in riding up, over, and in between a series of drumlins, you’ll encounter a surprising amount of steep climbing that leaves many rethinking the Cape’s supposed flatness. Throughout the trail network, look for rock gardens, drops, and jumps, some of which add an extra layer of fun and may take a few tries to send cleanly. The cherry on the cake is the Gravity Trail, built in a natural half-pipe reminiscent of some of the classic trails found in Vermont’s Northeast Kingdom. Don’t leave without checking it out. Since space is tight, Otis has a well-deserved reputation as a difficult place to navigate. Indeed, the trails twist and turn, almost on top of each other at times. Fortunately, Otis hugs Route 28, providing an easy landmark and a bailout back to the car. If you ever doubt your location, just head toward the sound of traffic or pedal west, and then, take Route 28 South. Of course, this is easier said than done. Did we mention these trails are twisty? Wompatuck State Park in Hingham, Massachusetts, is another great location. 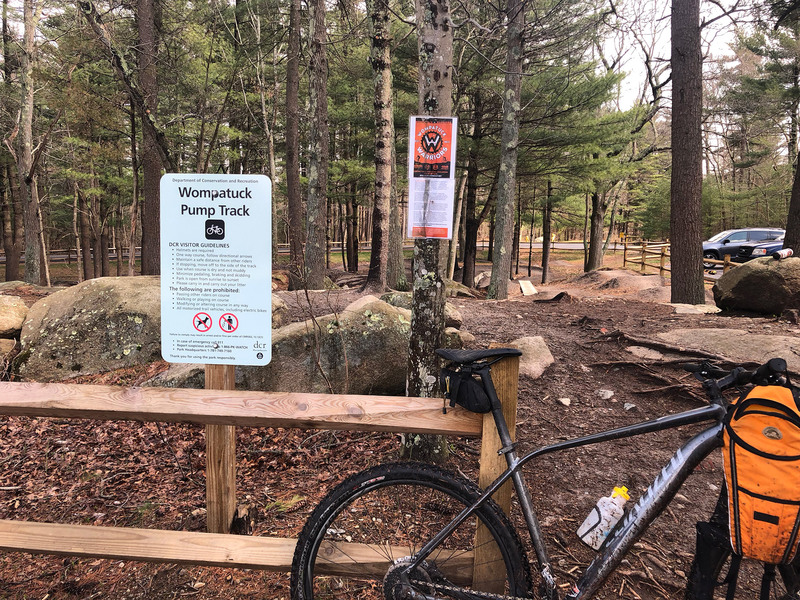 Built on land formerly occupied by the Hingham Naval Ammunition Depot Annex, it’s a bit closer to Greater Boston than the other two options and home to miles of fantastic mountain biking on single- and double-track. Wompy has trails for riders of any ability. Ones around Prospect Hill are a must-do for those seeking out singletrack. From the park’s lower left quadrant, riders can take either a moderate (but steep) doubletrack or one of the four singletrack trails to the top. There, they can swoop back down the same fast and flowy terrain as it winds down the hill. Definitely worth checking out, the section between the S4 junction at the top of the hill and the S2 at the bottom offers some of the state’s longest switchback singletrack. Also, consider the descent between the S5, S7, and S10 junctions. Wompatuck is full of surprises. As such, think about exploring the rest of the park’s trails. Around some corners, you’ll find abandoned military buildings dating back to the 1950s, many of which aspiring artists have spray-painted. Off to the sides, you may spot training sites, with ramps, jumps, and logs to play around on. And, near Wompy’s Visitor Center, you’ll find the Pump Track, an all-ages training course packed with berms, bumps, and jumps. Although many of Wompatuck’s trail junctions are marked, the many intersecting trails make it easy to get disoriented. To plan a ride that sticks to the area’s singletrack, check out the Friends of Wompatuck’s interactive trail map. Then, keep it open as you ride to ensure you don’t get lost. Do you have a favorite place to ride early in the season? If so, we’d love to hear about it! Leave your favorite early-season riding destination in the comments, so others can explore. Why Should I Use Trekking Poles? 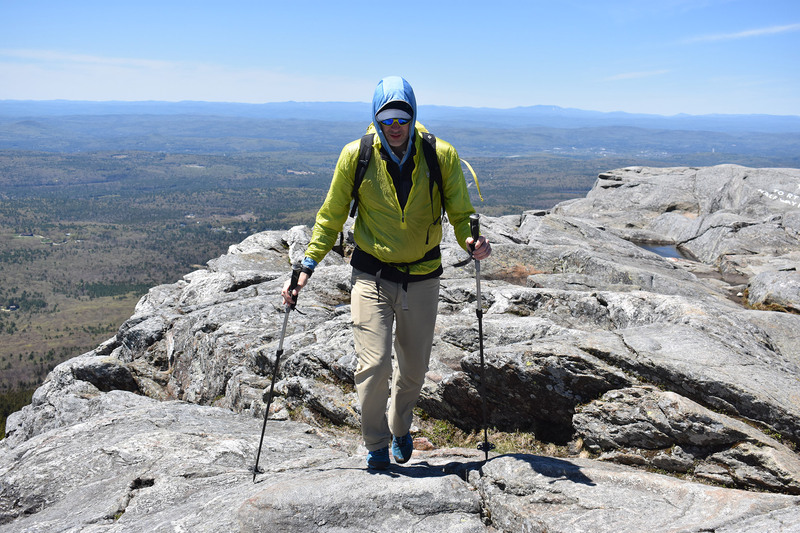 Improved efficiency, less wear and tear on joints, and increased safety are just a few of the reasons trekking poles almost always find their way onto gear lists like our “Top to Bottom: Gear to Hike the NH 48” roundup. If you’ve been on the fence about adding them to your kit, or you’re wondering why so many hikers you encounter are using them, here are 10 reasons why you should be reaching for your trekking poles as you head out the door. The Northeast is home to notoriously harsh terrain. No matter the season, hikers here encounter conditions ranging from snow to mud to bare rock—not to mention wet rocks and roots. Whether you’re heading up, down, or across, trekking poles allow for two additional points of contact with the ground, greatly increasing stability and traction. The act of repeatedly putting one foot in front of the other in rough terrain while carrying a load (even just a daypack) murders knees, ankles, and feet. Trekking poles shift some of this burden onto a person’s shoulders and arms, reducing the pounding your lower body takes. Furthermore, they can reduce swelling of the hands, a common ailment for many hikers. Incorporating your arms into the activity increases blood flow and reduces fluid pooling in the hands. Looking to increase your speed? Simply plant your poles and push with your arms. On steep uphills, they’ll take some of the weight off your legs, while on flat terrain, they’ll help propel you along. Even better, use your trekking poles like a metronome for getting your entire body to act in unison for relaxed breathing and a more consistent (and efficient) pace. Between snow melt and spring showers, water crossings reach their peak in the spring. Trekking poles are essential for safe crossings on hikes like Owl’s Head, as they allow you to test the water’s depth, get a feel for the strength of the current, and, once you commit, help maintain your balance as you wade or rock hop across. And, if you do slip, those extra points of contact are usually the difference between a wet shoe and total immersion. Much like how you can gauge the depth of a stream crossing with trekking poles, you can also use them to test other types of terrain. From finding out just how deep that snowpack is to how frozen that alpine puddle is or even how deep that muddy section of trail is, trekking poles are perfect for probing into the unknown. Whether you’re dealing with thorns growing into the trail, branches from blow-downs blocking it, or those “super-scary” spider webs hanging across it, trekking poles offer a convenient way to clear annoyances from your path. When it comes to situations involving twisted ankles or broken bones, trekking poles are a valuable supplement to your first aid kit. Serving as everything from a crutch to a splint, they come in handy when things go wrong. 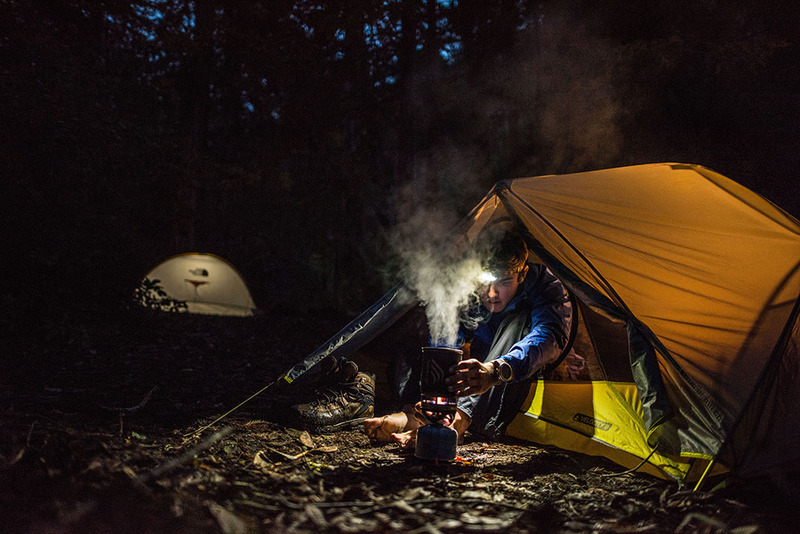 Thanks to the desire of backpackers to lighten their loads, many shelters (like the Black Diamond Mega Light Tarp) and tents now offer a fast pitching option that ditches traditional poles and instead uses your trekking poles to save weight. Most trekking poles are collapsible. So, if you encounter some steep, rocky terrain that requires free hands, just break the poles down, and stow them on the side of your pack. Try the same thing if you’re on terrain that’s conducive to running and that you absolutely want to be done with—for example, the flat section on the way out from The Bonds. If two is too many, try using just one pole. Switch it from hand to hand while hiking to get the same stability, all with less weight and one fewer tool to manage. We especially like the one-pole trick on outings where we’ll also be carrying an ice axe (like the Lion Head Winter Route); on trail runs that are mostly runnable but have a tricky steep descent (like the descent from South Twin to the Galehead Hut); or in situations where we’ll be transitioning from hiking to climbing and then back (like Henderson Ridge). Do you have another use for trekking poles that we didn’t list? If so, leave your suggestion in the comments.